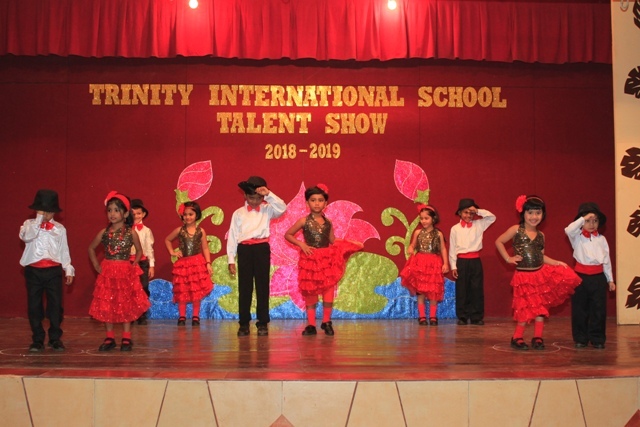 Staying abreast of the latest developments is the norm at Trinity International School, be they admin or academics or skill building. Among the many new initiatives, signing up with Univariety – a career counselling and alumni tracking programme is one of them. 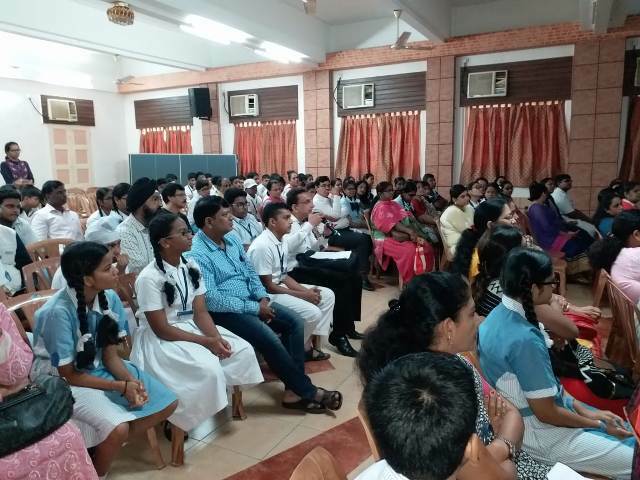 An orientation workshop for the parents and pupils of Stds. VIII, IX & X was conducted where they were apprised of the different ways that Univariety reaches out to pupils. Webinars, live chats with counsellors and guidance by school’s alumni are some of the channels. Univariety is doing commendable work in the field of career counselling and making the same accessible to schools. 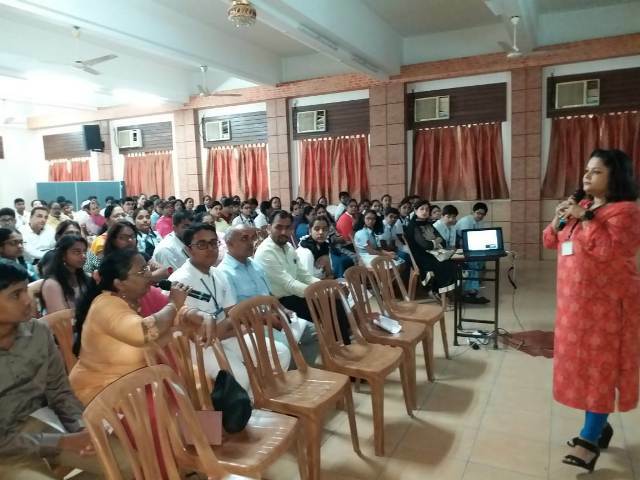 A pro parenting workshop was conducted on 12th March, 2019 in Trinity International School by Univariety. This workshop gave an insight into why extra curricular activities play a crucial role in securing admissions into well known colleges in India & abroad and how Promap can help build a focused and achievement oriented CV. 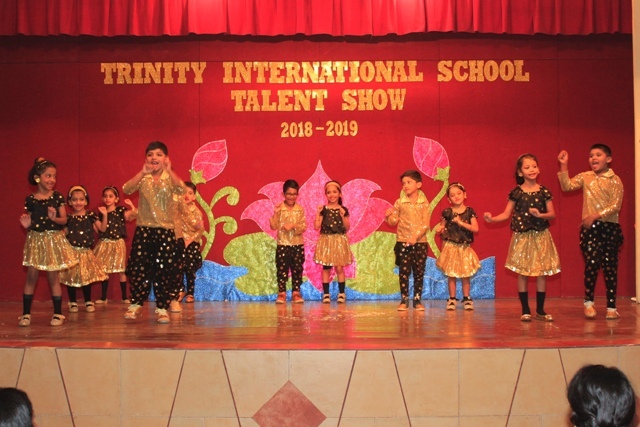 Trinity International School has always stayed abreast of the latest developments when it comes to academics & skill building among students. Keeping this in mind, Trinity International School generously gave Promap Scholarships to star students from stds VIII, IX & X. The Promap Scholarship will give access to five modules for the students about the entire college admission process, a customized Roadmap of extracurricular activities for the entire year and three extracurricular CV profile Building Counselling sessions. Apart from this, Univariety will do a Blog feature on the school, Digital Splash of the blog and mini feature of the three star students on social media. Rodrigo told the students of Jr.Kg A that Brazil is famous for gold and precious stones. When asked about their dreams at night some students answered they see stars, moon, etc. He showed them a video with Brazilian music and asked them questions related to it. Students were then engaged in an activity where they had to trace their palms to form a butterfly. Students of Grade 4 were shocked when Lucy Plummer told them that United Kingdom is much smaller compared to India. Lucy who is from London is a writer and loves to tell stories about travelling and people she meets. She has travelled to 27 countries so far. She came to India three years ago and liked our country so much that she stayed back. 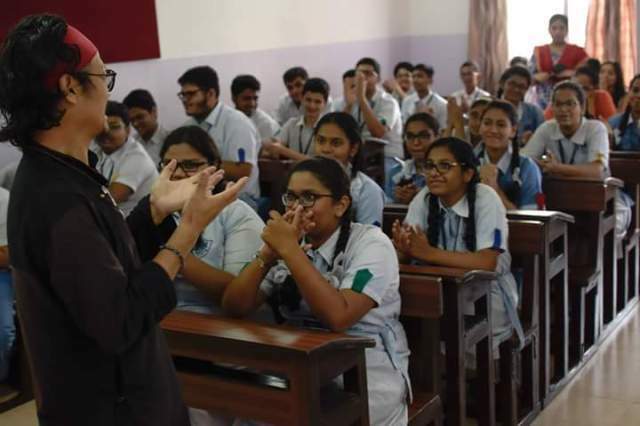 She told the students that distance between Mumbai and London is 8 – 9 hours. She also told them that Rugby is the biggest sports in UK. When asked whether they like being an only child, one pupil answered yes because there will be fights if he has siblings. At the end of the session, Lucy danced on a few Bharatnatyam steps that students showed her. Lucy told the grade 5 students that in U.K they don’t have monsoon season and that it’s very cold in winter and it snows making the roads icy and slippery due to which the schools are closed. When she asked the students why they like summer, some students said that they like to eat ice-creams and have cold drinks. The grade 6 students saw a picture of Buckingham Palace, and Lucy told them about an old custom related to the Queen’s guards where they had to taste the food before the King and Queen could be fed. She showed them pictures of various animals found in her country like – fox, badger, hedgehogs, cows etc. The children learnt that Christmas is the most popular festival in UK and people celebrate it by visiting each other and having traditional meals. They get Christmas gifts in stockings. 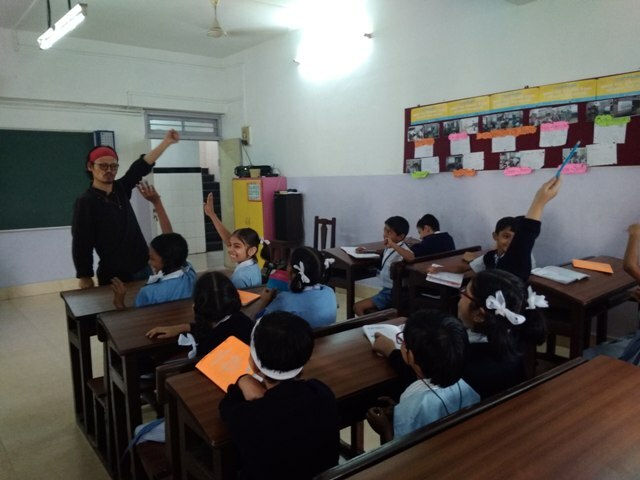 Tenzin Tsundue conducted an interesting Clap Talk session for students of Grade 3 and 6. 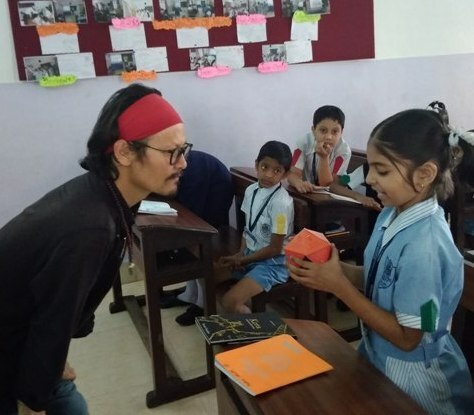 He invoked a feeling of curiosity in the students when he told them that he is a Tibetan but was born in India when his parents came to India as refugees. He explained to them that refugees are people who have to leave their country due to some danger. He also narrated to the students a story about buffaloes and yaks and how yaks went to Tibet from India and never came back. He then explained to the students that writers are the most powerful people in the world as they have the power to change people’s minds through their writings. When students asked him which language he wants to learn and what his dream is, he replied that he wants to learn the language of the birds and his dream is to go back to his homeland. He then sang a Tibetan song after which a boy from the class sang an English song and then a girl recited a poem. Grade 6 students listened with interest as Tenzin told them about his ways of fighting to win back his country. He told them about how he was jailed several times for his protests in Tibet as well as in India. 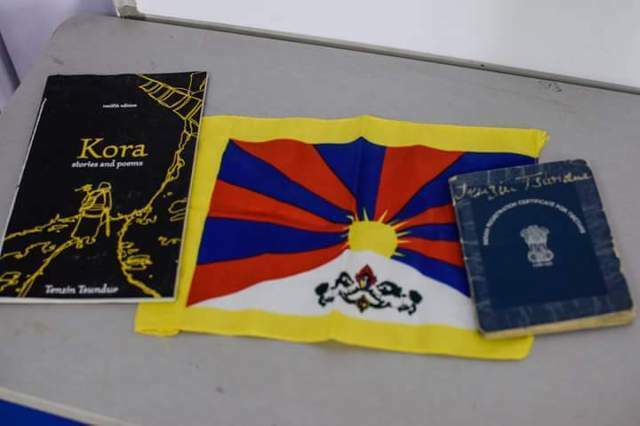 The students were touched by the Tibetan song he had composed during his time in the prison. When asked about what gives him so much strength to keep going so positively inspite of so many failures, he replied that his love for the country, his deep sense of longing for Tibet gives him immense strength. A student asked him the reason for wearing a band on his forehead, to which he replied that the band is a symbol of the pledge he made to himself in the 5th std that when he grew up he would work for the freedom of his country every single day. The most beautiful sight that Tenzin has seen is that of ants who work hard in co-ordination, are well organized and never shirk away from their duty. 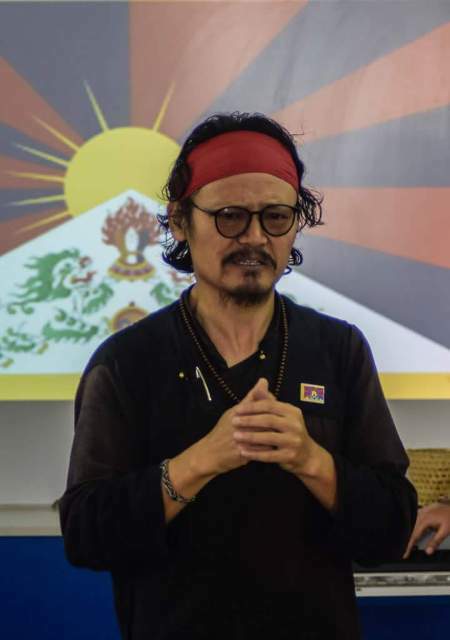 The students took away a lot from this session as through every word he spoke Tenzin encouraged them and taught them values for life of being responsible, organized , resourceful and determined. Tenzin loves the fact that in India inspite of the existence of so many languages people still live together. Tenszin ended his session by wishing students peace and happiness through his words ‘Tashi Delek’. Later Tenzin enjoyed watching a magic show performed by Asmaulhaq and Shlok. The faces of students and teachers standing on the ground showed their eagerness to begin the events for the most awaited Annual Sports day, for which they had put in days of rigorous practice. As has always been the tradition of the school, the day began by seeking the blessings of God after which the March Past students took their respective places as disciplined cadets, behind their House Captains and Flag bearers to march forward and take the Oath. 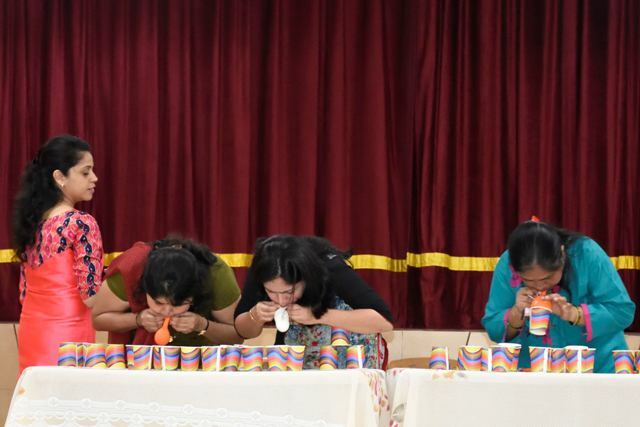 The Sports meet for the year 2018-19 was declared open by the Headmistress, Mrs. Mariamma Nair. Pre-primary, 1st and 2nd grade students then performed the Mass Drill. 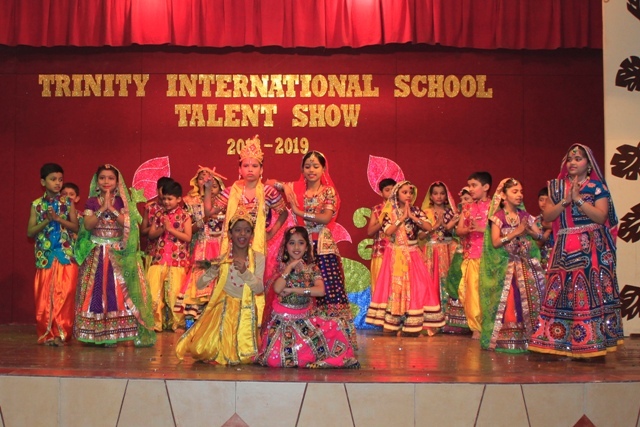 The parents enjoyed seeing the Hoola-Hoop Drill by the primary students and the Secondary students left no stone unturned as they showcased their talents through Yoga, Aerobics, Lezim and Tae-Kwon-do. Students of grade 8 beautifully showed how the world is becoming obsessed with the cell-phones through a Flash mob. The Fruit Race, Putting the toys in the basket, Rods and rings race, jumping race and putting the beads in a bottle by Pre-Primary children were worth watching. The secondary students put their energy into the races as they ran 50 metres, 80 metres and 100 metres not only to win medals but also to score points for their houses. The final round for events like Shot Put and Discus Throw too was held on the ground. The winners were awarded with medals and certificates. Shakib Mohammad Alam from class 8 and Sania Mohammad Alam from class 7 were declared the Best Boy athlete & Best Girl athlete of the year respectively. Yellow House won the Best House of the Year award. Not only the students but even parents got to be a part of the event as they participated in Musical Chairs. The students did not seem to be tired at all as they cheered for their parents. The students of grade 9 gladly welcomed Rodrigo Neves with a traditional Gujarati song. Rodrigo, the Clap Talk traveler from Brazil told the students various things about Brazil like the local language, geographical area, currency etc. He also told them about the beautiful beaches, forests and waterfalls, invoking a desire in students to visit Brazil and enjoy the breathtaking views. He told the students about the annual colourful carnival festival when they asked him about the various festivals celebrated there. He then performed a mono-act narrating a story of a woman who struggled for her life. 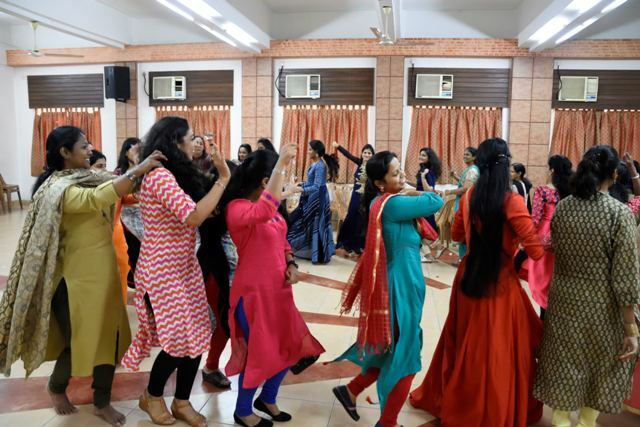 He also taught the students a traditional dance of his country after which the girls performed a traditional Rajasthani dance ‘Ghoomar’ and the boys performed the famous ‘lungi dance’ wearing a lungi i.e. a traditional south Indian attire worn by men. The boys tried to teach Rodrigo the dance and he seemed to enjoy wearing a lungi and matched the steps of the boys. The fun-filled session ended with Rodrigo singing the national anthem of Brazil. Rodrigo told the Grade 7 students about him being a part of a club that changed his life by teaching him a lot of soft skills. English is not so common for him, so performing in English skits and bands excites him. He also told them about how Brazilians segregate waste into 6 different categories in residential areas, educational institutes as well as in offices. He asked the students why it is important to protect the environment and what small things they can do to conserve the environment. The school hall of Trinity International School buzzed with activity as the students wrote ‘Letters of Love’ to the Syrian refugee children. 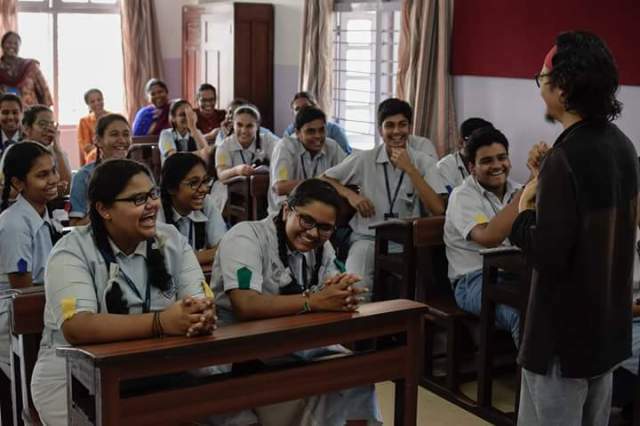 Pooja, a team member of the ‘Letter of Love’ organization began the Clap Talk workshop for students of Grades V – VII by asking them to find the difference between some before-after images and then asking them the reason for the change in the places given in the slides. Students gave various answers like Tsunami, floods, earthquakes, wars etc. she then asked them a few more questions leading the discussion to the Syrian war. She then went on to give a few details about Syrian war, the life of the Syrian refugees, etc. She showed them a few videos of the interview of few Syrian refugee children who spoke about their life, their hopes for future, etc. Watching the videos made the students very emotional as they got a glimpse of how those children are suffering. Pooja then asked them ways in which the students could help these children. Students responded that they could send some essential items, go and meet them, write them mails, send letters, etc. The session for Grades 8 – 10 began with Pooja giving some students a minute to speak about everything they did for the past 1 year. Students spoke about how they spent their vacations, their birthday, memories with friends, etc. She then showed them a video of a girl called ‘Lily’ and glimpse of her life from past 1 year which changed from happy moments to terrified moments of shock and fear from the war to her life as a refugee. Pooja also explained to the students the reason for the war, etc. When asked how they would want to make things better a student answered that by showing love and gratitude to another we could create a chain that would reach out to these children too. Another student answered that the school should organize camps in school and students should live like refugees to get an experience of what they go through and see how they feel in order to be sensitized and be able to clearly understand how the refugee children feel. Pooja then told them about the action oriented approach by her organization by delivering handwritten letters by students to refugee children on New Year, Valentine’s Day, World refugee day etc. She even showed them a video which captured the refugee children’s happiness and gratitude by receiving the letters. In order to be another reason for smiles on those children’s faces, the students put their heart and soul into writing beautiful letters to the refugee children. 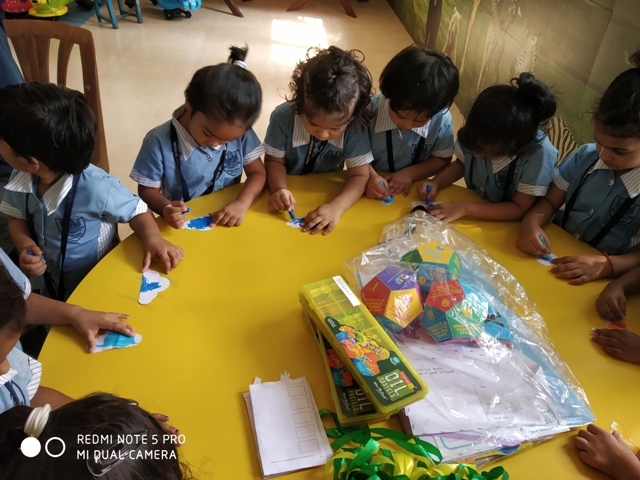 Students of Grade II enjoyed making Rangoli using flowers with their Clap Talk traveler Samodhya Sandeepani Bandara. The Sri Lankan traveller shared a lot of interesting things about her country. She specifically told about her city ‘Kandy’ which is famous for a temple called ‘Temple of Tooth’. In response to students’ reactions of the unusual name she explained that in this temple, the sacred tooth of Gautam Buddha is placed in a gold casket which is shaped like a stupa. She told them that the Srilankan script is called ‘Sinhala’. 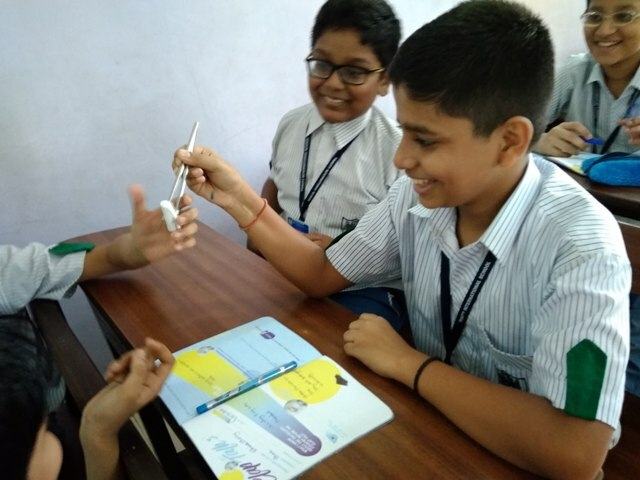 Students not only got to see the Srilankan currency but also learnt to convert Indian – Srilankan currency (i.e One Indian Re = 2.4 Srilankan rupees). When asked how they spend time with their grandparents, students gave various responses like going for a walk with them etc. Samodhya said that she watches funny cartoons on televisions when students asked her what she does when she gets angry or sad. The little ones had fun learning the ‘coconut clap after which they expressed their gratitude to Samodhya by presenting her with a paper lantern and a few Diwali delicacies. Students of Grade III B had a very informative Clap Talk session learning various things about Ghana in Africa from the Clap Talk traveler Christian Ohene Nyanor. Christian explained the significance of his country’s flag colors that Red stands for their fore fathers’ struggles, Yellow for the mineral wealth, Green for rich vegetables and Black star stands as a symbol of African Unity. He showed the students ‘Ghana Cedis’ the currency of his country after which the students explained the significance of the Indian Flag and 54 languages in his country. The students were very eager to try wearing the traditional dress ‘Dashiki’ that Christian brought to show the students. They expressed their surprise when they were told that in Africa the names of the newborn are kept based on days of the week and the gender of the baby. For e.g. : On a Friday, the name given to a baby boy would be Kofi and Afia would be the name given to a girl. He then told the students about the 3 types of schools in Ghana i.e. Modern, Semi modern and local. In every school he said, the students are made to clean their classrooms and corridors before the start of the day to inculcate the habit of keeping the surroundings clean. He then asked the students why they should keep the environment clean to which a student answered that there will be less pollution and spread of diseases will be curtailed. The session ended with Christian dancing with the kids and teaching them dance like ‘Azonto’ and Agbadza. The students also learnt a few African words like ‘Maakye’ and ‘Wuho te sen’ which means ‘Good Morning’ and ‘How are you’. The students recited a Poem on ‘Mumbai’ giving a gist of life in Mumbai. Christian recited a nursery rhyme in his language (Akan Rhyme) for the nursery kids. He also taught them the word Medaase in his language which meant ‘Thank You’. Students had fun in the activity where they had to recognize the animals he showed them on the PPT slides and point out towards the same animal on the wall. Christian helped the students in making wall hangings after which he recited a few rhymes in English which was thoroughly enjoyed by the students. Farukh Hakimi, the traveler from Afghanistan told a lot of interesting things to the students of Jr Kg B about his home country. He told them that Afghanistan is an Islamic country that is very famous for exporting dry fruits, fruits and vegetables. He told them that the Golden Eagle is the national bird while the snow leopard is the national animal and the national food is Pulav. He also told that ‘Bozkashi’ is the national sport and Farukh’s favourite game is football. The bread in his country is one metre long and a watermelon is 10-15 kg in weight. 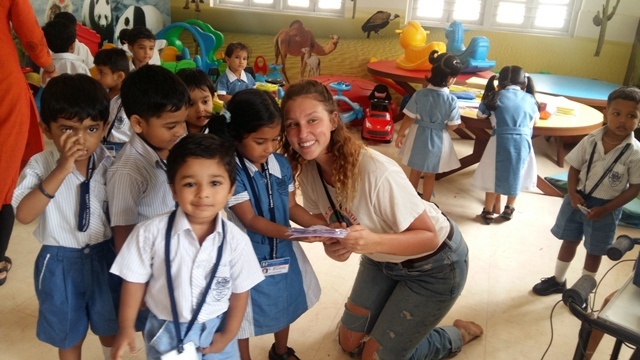 The students were surprised to know that every Friday they have holiday and they go for a picnic to a spot called ‘Pansheel’. Farukh then showed them the traditional dress and the currency notes of his country. When he asked the students what they like to eat, students gave various answers like Aloo Paratha, momos, kebabs etc. He then performed the finger puppet activity in which he wrote his name and drew a smiley face on finger puppets and the students then coloured the puppet. The programme began with the choir group singing the prayer song, it was followed by the Prayer Dance ‘Tujya Namo’ through which the students gracefully showed reverence to God. The Skit presented by the students gave a lovely message of Unity using the analogy of a sentence. Some dances paid glorious tribute to the soldiers and awakened a feeling of patriotism reminding us that ‘India’ is not just a name but a feeling of pride in an ‘Intelligent nation developing in all fields’. Other dances showed us the importance of relationships and values like sharing, caring, kindness, respect and responsibility. Awareness was created through a dance, underlining the urgent need to take care of our environment by saying ‘No to plastic’. 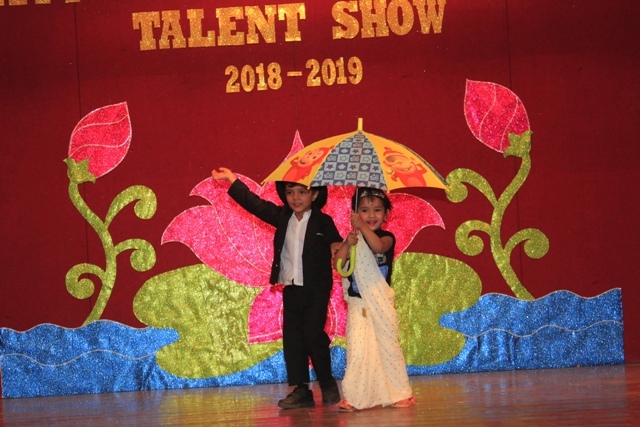 Vihaan from class IV captured the audience’s attention as he showcased his musical talent by playing a beautiful medley of few Bollywood songs on the casio. 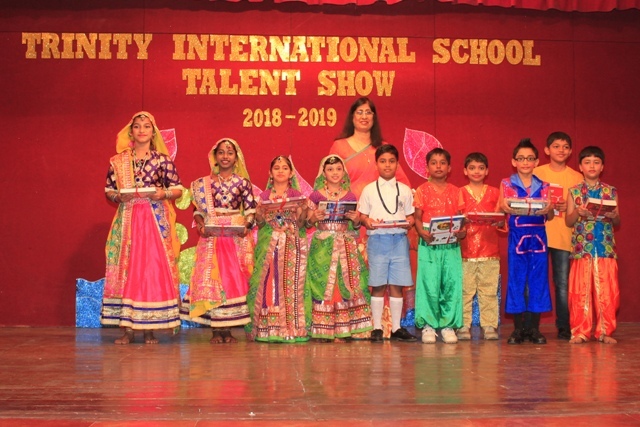 The ‘Bollywood Dhamaka’ enthralled the audience with their lovely performances as they danced to peppy Bollywood songs while the ‘Zumba rockstars’ too received a loud applause for their performance. The story of Radha-Krishna was beautifully depicted through a dance, showing the different phases of Lord Krishna’s life from his birth to his victory in the battlefield of Kurukshetra. Academic performance of students was celebrated by awarding prizes which was presided upon by the Ex-Officio Secretary, Mrs. Vinita D’Souza. The programme began with a prayer recited by the little ones followed by Sr.Kg. students honoring Lord Ganesha through their prayer dance. Nursery students then performed a cute action song ‘We shall overcome’ and ‘I am happy’ reminding the audience that the more we give, the more we will be happy. Jay Makhija from Nursery, dressed as a sunflower spoke on the beauty of the flower. While Ruhaan Gabriel from Sr.Kg. gave a speech on the harmful effects of mobile radiation on birds, animals and other creatures. He reminded everyone that we human beings who are more powerful than other animals are responsible for protecting the environment and the living beings in it. 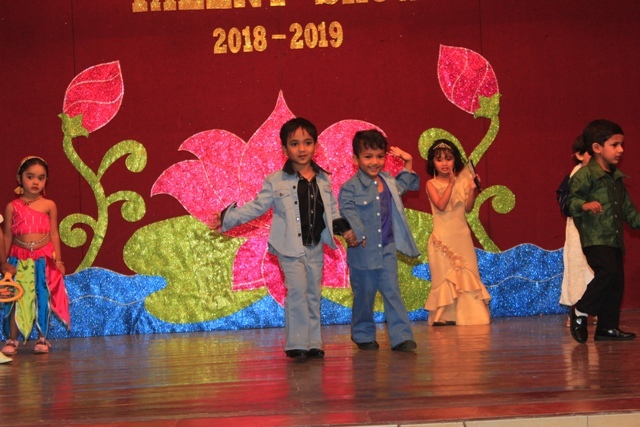 There was loud applause as the tiny tots of nursery performed a fashion show taking everyone decades back, dressed as famous bollywood characters like Salim and Anarkali, Shammi Kapoor, Jeetendra and Leena, Madhuri, Sridevi, Amitabh and Dharmendra as Jay- veeru, Amar-Akbar-Anthony, etc. 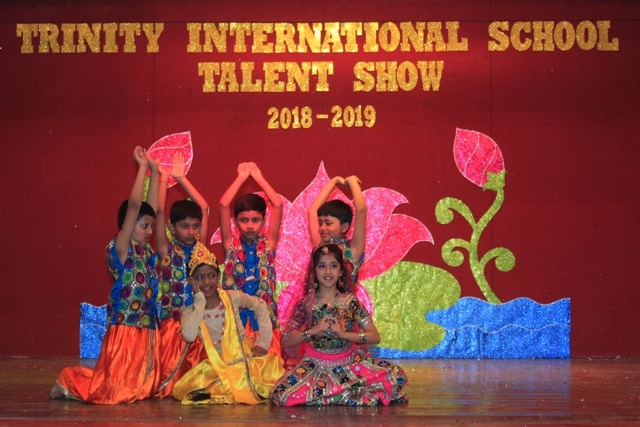 Students of Jr.kg performed a dance on devotional songs showing a glimpse of Hanuman, Shiv-Parvati, Radha-Krishna and Ganesha. Sr.kg kids dressed as monkeys, tigers and elephants performed a cute animal dance followed by the Jr.kg dancing to the tunes of the Spanish song ‘Un-dos Tres’. 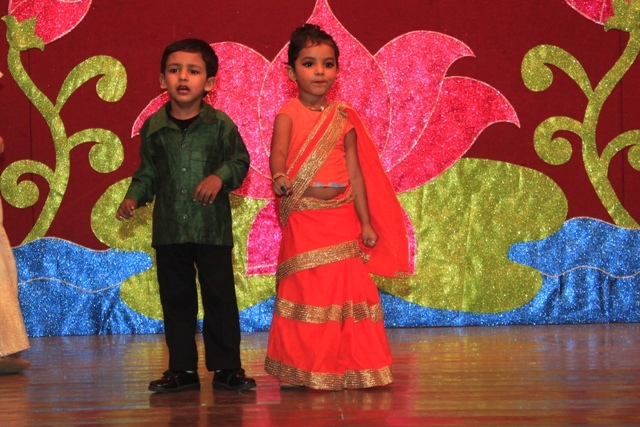 The passion and pride for Mother India was reflected in the dance of the Sr.kg kids. Ayush Patel from Jr.kg spoke on the solar system. Sr.kg students set the stage on fire as they sent out their message of being united to save our mother earth. 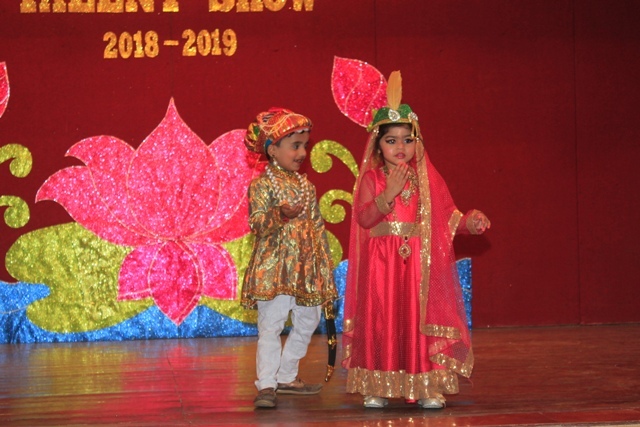 The little dolls of Gujarat captivated the hearts of the audience as they performed the Garba dance. the little ones then showed examples of bravery , strength and courage as they came dressed as Jhansi ki Rani, Bhagat Singh, Shivaji Maharaj, Mangal Pandey, etc. Each student was awarded with the participation certificate. The students of Grades 3 had a fun-filled Clap Talk session with Hadil Alchcargi from France. Originally from Iraq, Hadil loves to travel and has lived in different countries like Morocco, Egypt, U.S.A, and living currently in France. The students were amazed to learn that France makes 350 kinds of cheese and that France gifted the Statue of Liberty to U.S.A. She asked the students about which country they would like to go to when they grow up and students named various countries. At the end of the session a student read a poem on ‘National Flag’. She asked the kids about food they get in Mumbai and students named some Indian dishes like Pav Bhaji, Wada Pav, Samosa, etc. Students too asked her questions like what is her favorite part of the day and what kind of clothes do people wear in France. Hadil taught the kids French words like ‘Bonjour’ (Hello) and ‘Merci’ (Thank you). Grade 10 students left no stones unturned to make Hadil feel welcomed when they showered rose petals on her and felicitated her with a garland. She told the students about the Eiffel Tower. Carpooling is a very common mode of transport to go from one city to another in France. Students asked her about how she spends most of her money, to which she answered that she spends it on food. She then asked the students whether it is important to visit places and learn their culture. Few students answered saying yes, as it helps to learn new things and widen their horizon, whereas, some were of the opinion that it is not important to travel as it could be difficult for some people to adapt to the place. At the end of the session, students not only made her taste a variety of Indian dishes like Idli-Sambar, Medu-wada, Fafda, Jalebis, etc. but they also taught her to play Garba (a traditional dance of Gujarat). Reinaldo, a clap talk traveler from Brazil had a great session with grade 1 kids as he told them about his country. He encouraged the students to learn different languages as he himself was a multilingual. He knew Portuguese, Spanish, German and Hindi. He also taught a few important values of being tolerant, giving respect etc. to the little ones. Students asked him what his favourite story is. The session ended with Reinaldo teaching them to make funny faces for the selfie. He told the Grade 8 students about his hobbies like playing football, cooking, reading, travelling, etc. He also told them how they celebrate the New Year on the beaches with lots of fireworks, and all of them dress in white. Students asked him about his experience in India and he told them about how he feels funny travelling in the local trains here. Clap Talk traveler Cherry had a great session with students of Grades IV as she told them about her country China. Cherry loves to design, travel, play chess, etc. She likes the Indian culture and is here in India as she wants to do something for the poor kids. Her dream is to visit Taj Mahal. Students asked her about various festivals celebrated there. She then told them about the Chinese New Year which is an important celebration of China. Students then told her about the relevance of Guru Purnima. They also spoke about Dr. A.P.J Abdul Kalam. 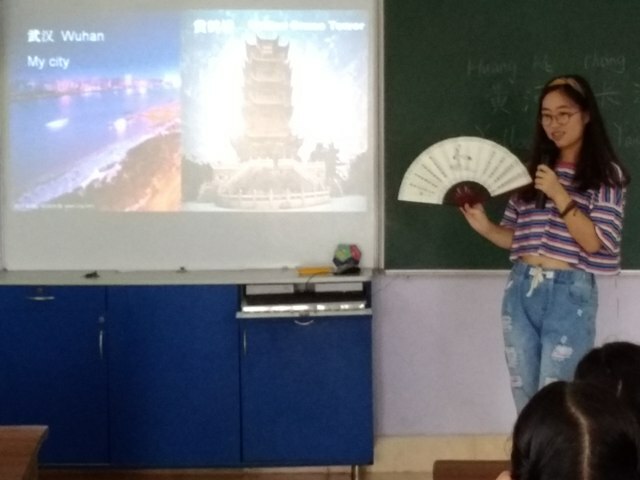 Cherry told the Grade 7 students about the Chinese flag, The Great wall of China and the Shanghai city which is similar to the city of Mumbai. Children were amazed to learn about the Chinese New Year. Cherry also taught them the Chinese phrase ‘Ni-Hao’ which means Hello. Students then had fun trying out holding chopsticks in the right way. When she asked the students about what they would like to change about their country, a student said that she would want the pollution of our country to be reduced. 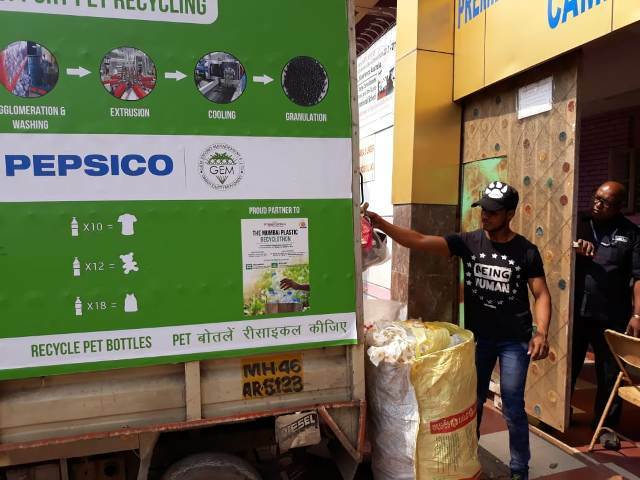 The Mumbai Plastic Recyclothon created a buzz in the city encouraging people to step out and give back to the society generously. Trinitians too felt the need to do something for the society as responsible citizens. Hence plastic was collected in school from 28th Sept‘18 to 1st Oct’18 for the Daan Utsav. 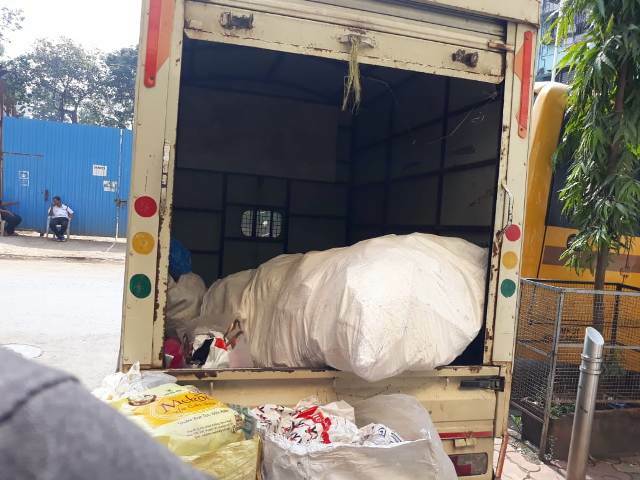 Students, teachers and staff donated plastic bags, plastic bottles and tiffins and other plastic materials which were handed over to Project Mumbai on the 4th Oct’18. Project Mumbai is a non- profit organization engaged in bringing positive change in the society. They have engaged the people of Mumbai to participate in what could be India’s most massive plastic donation drive. Their aim is to collect approximately 250 tonnes of plastic and recycle the plastic to make benches and waste bins out of it. Trinity International School is proud to have been associated with this venture. It has always been our endeavour to inculcate a sense of empathy and responsibility in our students. The students of Grade I enjoyed their Clap Talk session with Miguel Magalhaes who is from Portugal. He told them about the cleanliness in his country and the importance given to sports there. He also explained to them the symbolism of his flag, the Green colour of the flag symbolizes ‘hope for the future’, Red symbolizes the ‘blood of the nation’ and the five blue shields represent ‘Moorish Kings’. Miguel asked the students what they want to change in India and a student answered that she wants to get rid of the land pollution in our country. He also showed them the currency of his country and later taught them a few steps of a folk dance which the children loved learning. 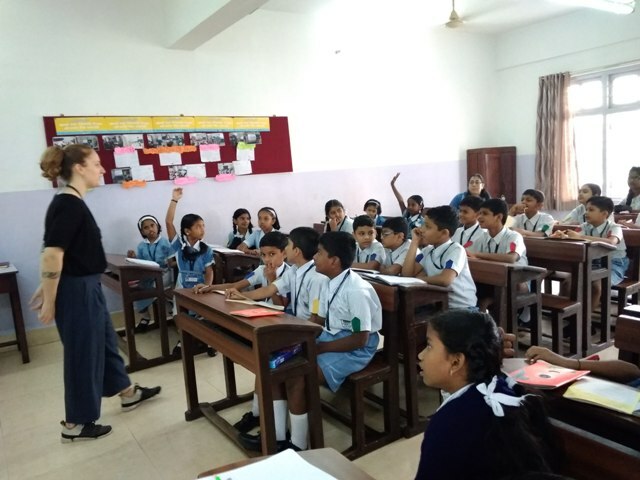 Gretchen Andrews the Clap Talk traveler from U.S had an enjoyable session with the students of grade VIII. She told them about her country. How they have planned cities where they have separate paths for cycle riders. She told the students about commitment towards the environment by reusing plastic bottles. When students asked her what the various problems in her country are, she mentioned the problems of gender inequality and color discrimination. 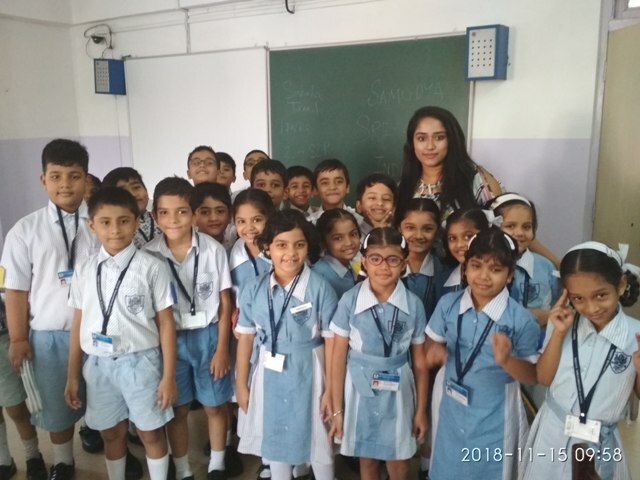 The students had a great time when she told them of her experience in the local trains of Mumbai. She sang a song for the students after which one of the students sang a song for her. The kids of Sr.Kg had a great time with the clap talk traveler, Sihan, from China. He showed them pictures of different vehicles in China like the aeroplane, train, bicycle, etc. He asked the kids which animal they would like to become and a kid answered that he would like to become a monkey as he likes banana a lot. They had a great time learning to write and pronounce the numbers 1-5 in Chinese. 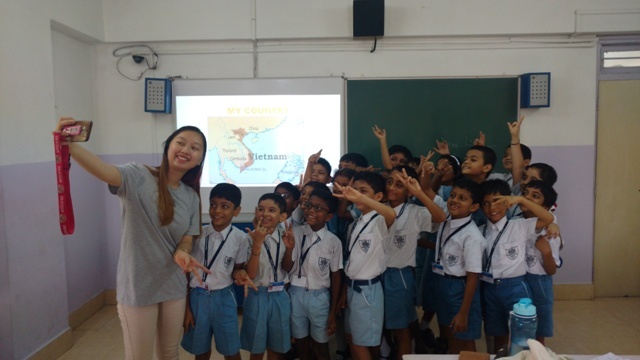 The students were given an activity in which they had to draw the flags of India & China as one flag; they enjoyed this activity a lot. Sihan told the grade 2 students about how the people in China love to ride bicycles, he also told them that bicycles could be rented for travelling and they can also be tracked using G.P.S system. He showed the kids a picture of The Great Wall of China, Shanghai – Oriental pearl T.V tower etc. with the help of a PowerPoint presentation. Students asked him funny questions like why people from China eat only noodles. He then ended the session by asking students to draw the Oriental Pearl T.V Tower. Flowers and cards with touching messages made by students are the highlights of 5th September, a special day for Teachers. 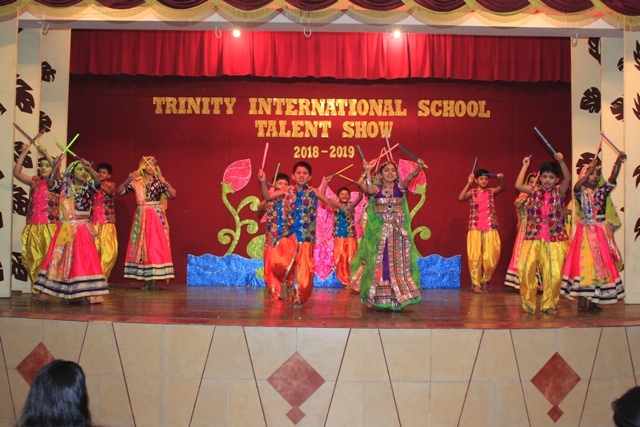 The day was celebrated with enthusiasm in Trinity International School. The students from class 10 donned the role of teachers and were assigned classes to teach. Students got firsthand experience and appreciated the hard work and dedication required to be a good teacher. 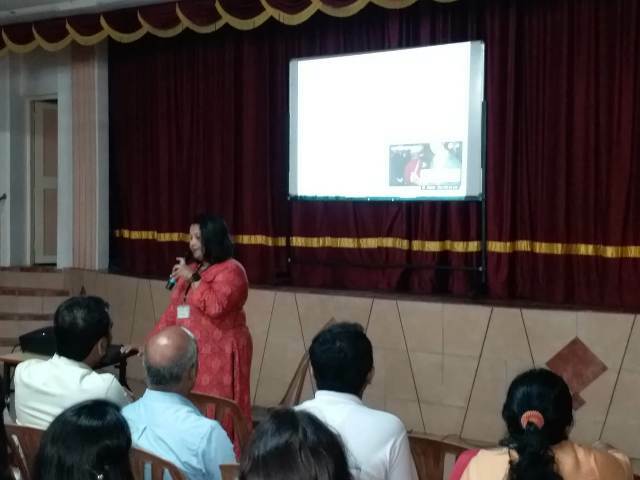 An event was organised where the Principal, Mrs Vinita D’Souza addressed the gathering and spoke about the challenges faced by the teaching community today and how teachers have to emerge above and beyond those issues. The teachers were in for a surprise as it was time to relax and have fun. 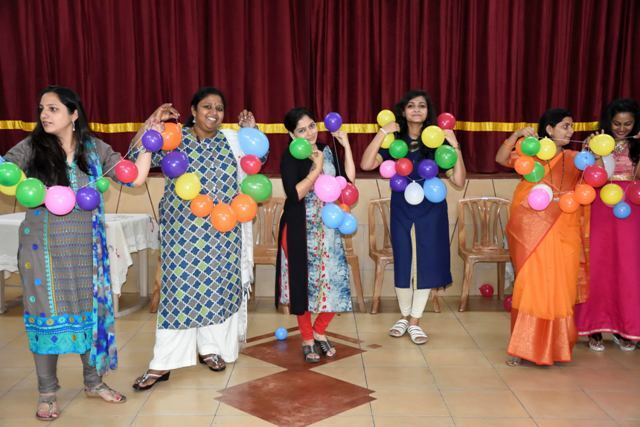 A series of games and fun activities were organised for the teachers. The hall reverberated with peals of laughter as teachers competed to win the games. The day came to an end with scrumptious food, fun, laughter and some great music. 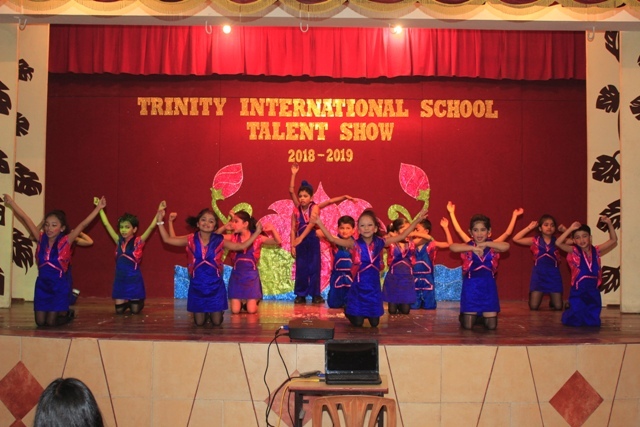 The 71st Independence Day was celebrated in Trinity International School with pride and patriotism. The school choir led the gathering in seeking the blessings of the Almighty. The national flag was unfurled by the Principal, Mrs. Vinita D’Souza which was followed by a soulful rendition of the national anthem. Thought-provoking speeches reinforced the importance of freedom. The speakers also spoke about the sacrifices of innumerable heroes – known and unknown. A patriotic song in the national language evoked a sense of allegiance in the audience. The event ended with singing of the national song ‘Vande Mataram’. The world lost a gem, Dr APJ Abdul Kalam on 27st July 2015 .This has become a day to reflect upon the lessons of one of the greatest teachers of our country. To pay tribute to this humble soul, varied activities were conducted. The students of primary watched animated videos about Dr Kalam’s childhood .These anecdotes from his childhood imbibed the values of simplicity and humility in the young minds. 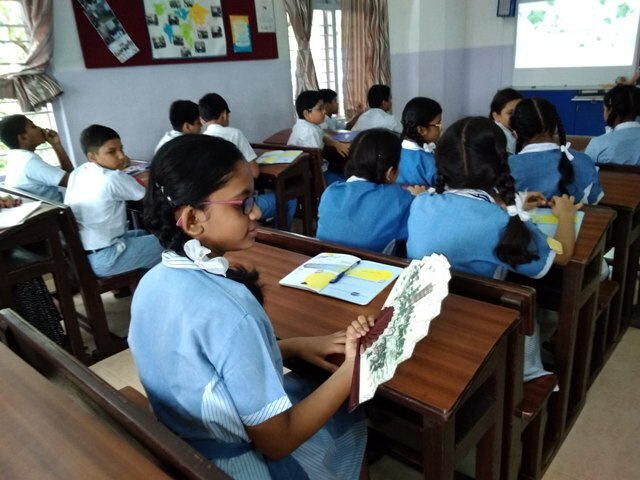 Students of the class five and six paid their respect to the legend by creating collages with quotes from his autobiography , ‘The Wings Of Fire’. Class nine were inspired when they found out about the achievements of a simple man from a small village. These activities ensured that the young impressionable minds are inspired to lead a meaningful life in service of the country and the world at large. Dr APJ Abdul Kalam has been and always will be a great source of inspiration for generations to come. Poetry is when an emotion has found its thought and the thought has found words”. 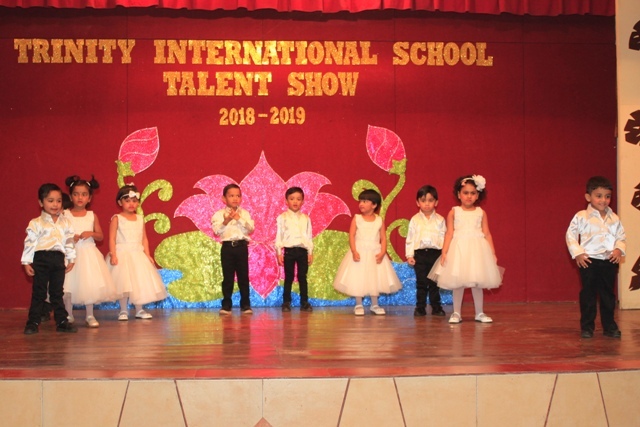 An Inter house Poetry Recitation Competition was organized on 16th July 2018 at Trinity International School, for the Primary section. Beauty is the realm of Poetry and the audience witnessed beauty. Children enjoy in various aspects such as expression, thoughts, feelings, rhyme, rhythm and music of words. What accentuated this beauty was the confidence with which children from the Primary section came forward. The themes ranged from ‘Make the Mother Earth clean’, ‘Save Water’, ’Stay Happy and Healthy’. They were judged on parameters like content, delivery, body language, confidence and expressions. The judges for this competition were Mrs. Davinder Kaur and Mrs. Rakhi. 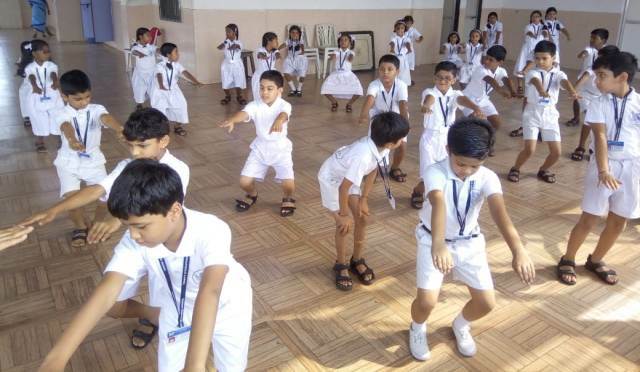 International Yoga Day was observed on 21st June in Trinity International School with great enthusiasm .The day began with a special assembly conducted by the Physical Education teacher Anita Sharma. She apprised the students about the importance of Yoga and how practicing it everyday impacts our lives in innumerable ways. The students then performed a few ‘asanas’ under the guidance of the PE teacher. She also encouraged the young minds to meditate everyday in order to achieve higher cognitive abilities. The Eco Club of Trinity International School renewed its pledge and commitment towards protecting the environment and creating awareness among the students by selecting new office bearers for the academic year 2018-2019. Selected pupil from the class VI – X constitute the Eco Club council of members. 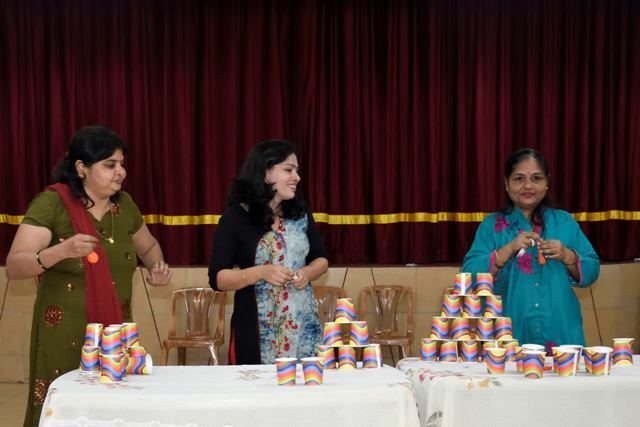 The badges were handed over to the members by the Headmistress, Mrs. Mariamma Nair in a special assembly that was conducted by the Eco Club co-ordinator. The pledge was administered by the newly elected Eco-warrior Rishita Valecha from Std X. The Eco Club has a number of activities lined up for the new academic year. 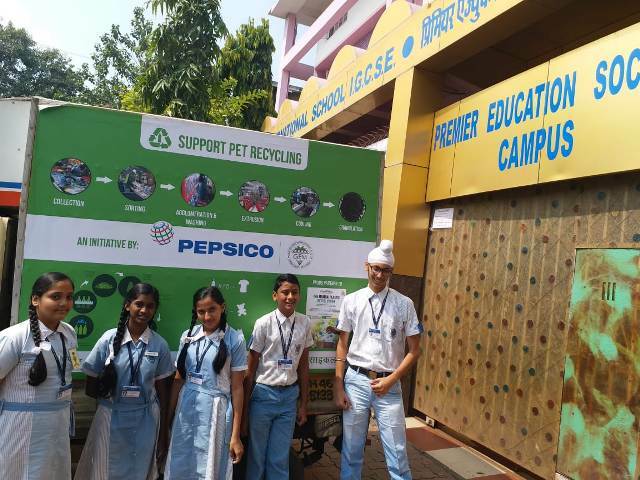 In the past, it had created awareness among pupils about conserving precious non-renewable resources, waste segregation, personal hygiene and keeping one’s surrounding clean. This year each class has to create an Eco Code which will be their challenge for the entire year and towards achieving which the entire class has to work. The system of awarding house points and class points will continue this year as well. Trinity International School’s proudly celebrated its very first Convocation Ceremony for the outgoing class of IGCSE for the academic year 2017-18. 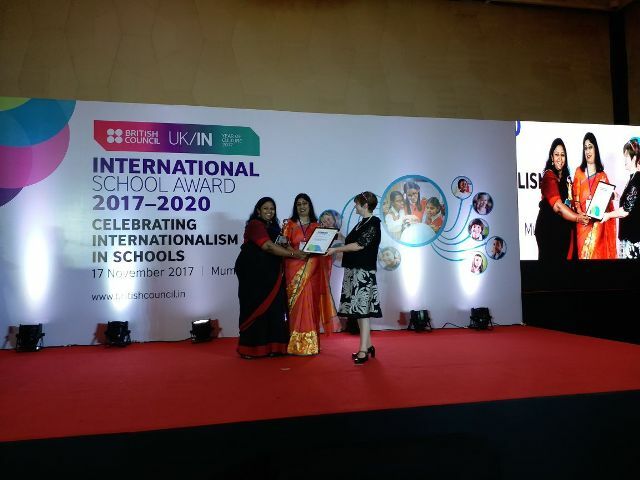 Presiding over the ceremony was the Principal Mrs. Vinita D’ Souza who was accompanied by the Administrative Officer Mrs. Menuka Vijan. The Ceremony began with the lighting of the lamp with the chants of ‘Gayatri Mantra’ playing in the background. This was followed by a prayer dance recital. The Principal declared the ceremony open and delivered her welcome address in which she chronicled the twelve years that the students had spent in the institution. She also wished them for a promising future ahead and gently reminded them about their duties towards their parents, their institution and their motherland. After the speech, the students were awarded certificates. Next came the most awaited part of the programme. The outgoing Head Girl, Ms. Rhea Menon delivered the valedictory speech in which she reminisced the years gone by, the fun they had, the unbreakable bonds of friendship they had forged, the lessons of life they learnt and the contribution of the teachers and the institution in shaping their characters. Mrs. Menuka Vijan then delivered the vote of thanks and declared the ceremony officially closed. 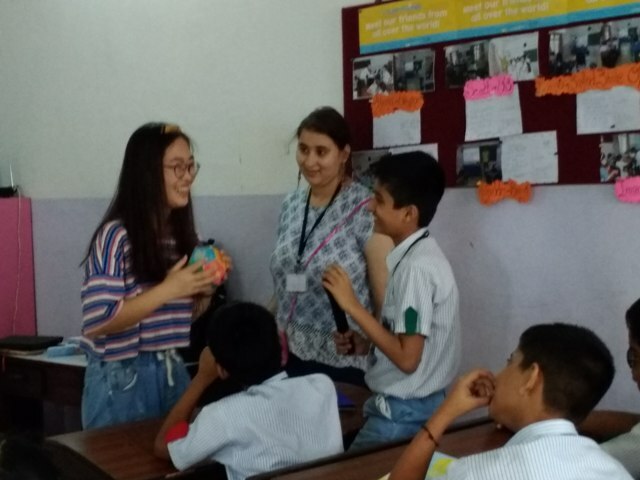 Charles Attwood Kottler, a 22 year old avid traveler from US built a good rapport with the students of Grade 7 when he not only told about his country but also involved students by asking them questions on India. He and Arjit Singh, an Indian traveler then explained to the students about gun shooting and the authorization of guns in the United States. 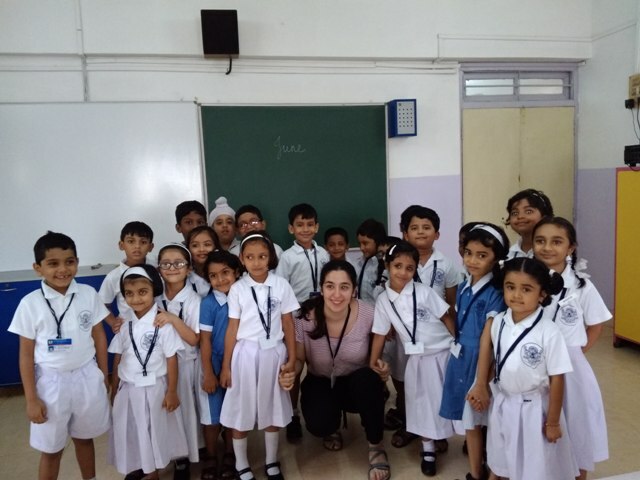 Grade 1 students of Trinity International School thoroughly enjoyed the Clap Talk session with June Olaizola from Spain who shared a lot of interesting things about her home town. Truly Spain sets an example for us as the people there prefer public transport, follow the ‘no honking’ rule and use 5 garbage bins for papers, organic waste, plastics, tetra packs, etc. Students enjoyed answering her question of any one rule that they would like to break. June was impressed with the answers of the little ones especially as one child told her that she doesn’t like to break rules as she is obedient to her parents. June ended the session by showing the students a few of her dance steps. 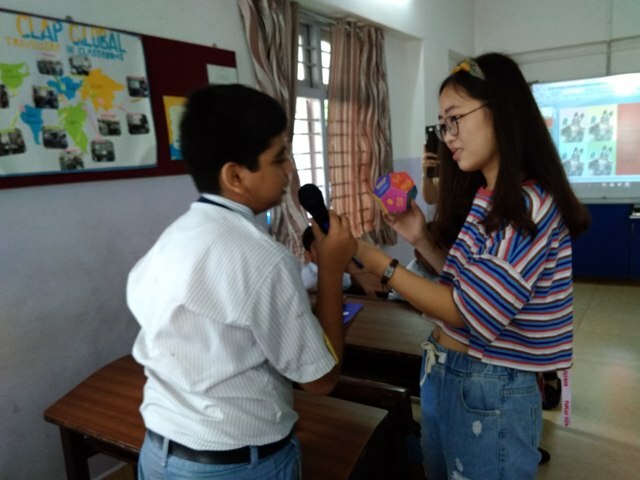 Dang Pooh, a 20 year old young Vietnamese traveler had a great time with students of grade 5 where he highlighted a few aspects of his country and also taught a few Vietnamese salutations to the students like ‘XinChao’ (Hello) and ‘Tambiet’ (Goodbye). 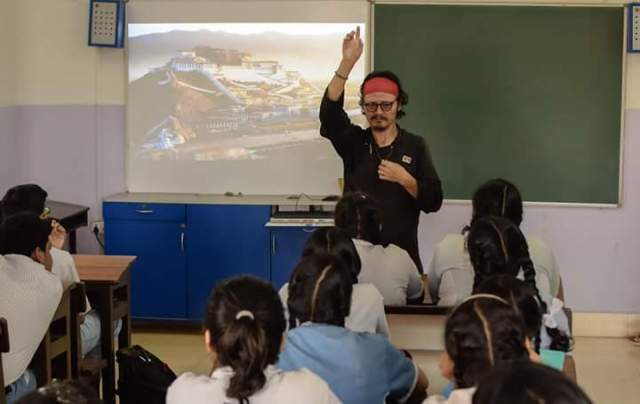 He showed pictures of a few interesting and mouthwatering delicacies of Vietnam and also taught the students how to use chopsticks. Dang asked the students what they liked most about India. A student answered that India is a multi-cultural country, we have so many traditional clothing and she likes the different cultures. Dang asked the nursery kids which animal they would want to become, some kids said they would want to become a tiger, horse, dog, etc. He also asked the students to name a color they like and give a reason why they like that color. A child answered that he likes the color blue because the sky is blue. They had fun making the sound of rain and then singing a Happy birthday song. In his session for Grade 8, Dang explained to the students the symbolism of Vietnam’s Flag. He told them that the color ‘Red’ in the flag signifies ‘blood’ and the ‘star’ signifies ‘freedom’. He then asked students to tell him the symbolism of the Indian Flag. 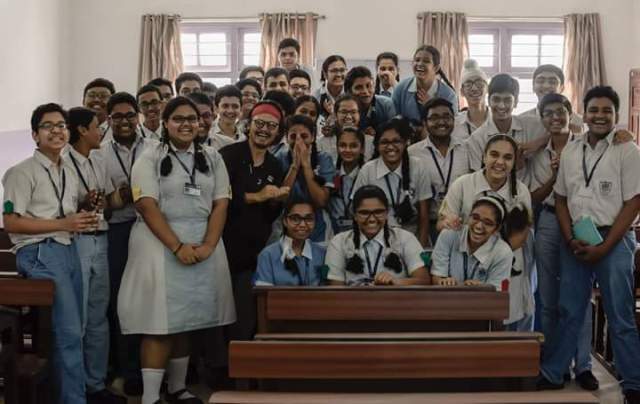 He ended the session by singing a Vietnamese song for the students and told them its meaning after which one of the students too sang a song for him in Hindi. 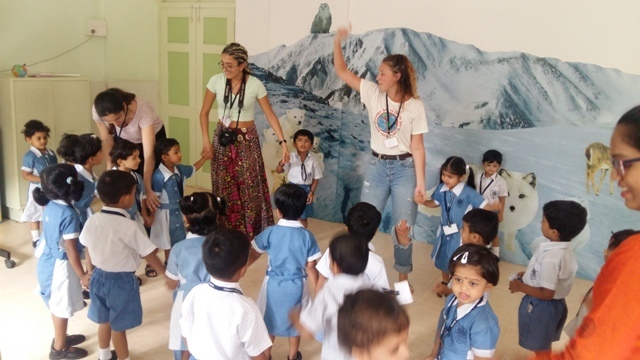 The students had a great time learning a Vietnamese dance after which they taught Dang a few bollywood dance steps. Lamia Mahfouz, a 19 year old Jordanian traveler conducted an interactive session with students of Grade IX. Her session became all the more interesting when she told the students about her hobbies that including skydiving, scuba diving, making vlogs on YouTube, boxing, etc. 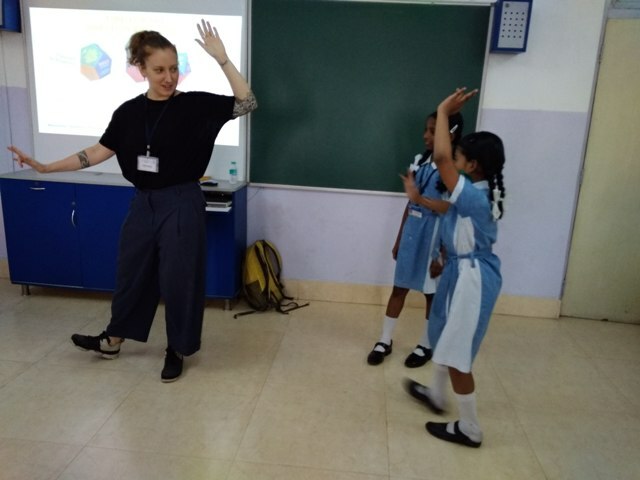 She not only taught them a few salutations in her language but also danced to a few bollywood steps that students enjoyed teaching her. She asked the students how they want their dream school to be and some gave interesting answers like they want their dream school to be without exams, lots of games periods, less homework, etc. 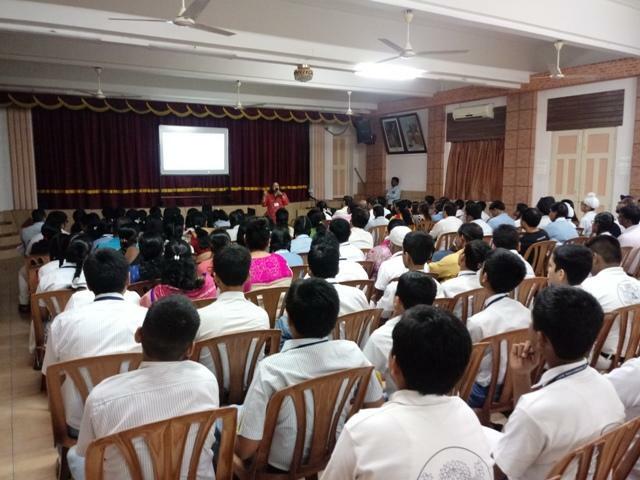 The students of grade 6 apprised her about Ganesh Utsav, the iconic festival of Mumbai. They shared the relevance of the festival with Lamia after which they worked together and recreated the festivity. They arranged the traditional ‘Puja Thali’ to welcome ‘Ganpati Bappa’, sang devotional songs and then performed the ’Aarti’ to invoke the blessings of their favorite deity. Lamia too participated in the ceremony. The students served her with the traditional ‘Prasad’ made during these days. 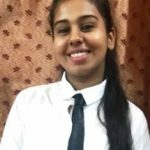 Lamia was intrigued about this festival and promised the students that she will surely witness the festival here in Mumbai. Lamia enjoyed the session with the cute nursery students where she taught them few Arabic words like Marhaba (Hello) and ‘Ismi’ (name). She asked the students whether they like sharks, but the students replied that they don’t but they like dolphins. Students also asked her about her favorite story, her favorite game, etc. She jumped and danced along with the students and finally they had a selfie session for which all the little ones gathered eagerly. Grade 6 students of Trinity International School gathered around Scott all eager to show him the paper planes they made after an amazing Clap Talk session with him. They were amazed to learn that Scott from US is one of the rare ones from the western countries who live in a joint family. He asked them various questions like ‘why according to the students wars take place?’ One student answered that each country feels that they are the best which causes disputes and ultimately leads to wars. Scott asked the nursery kids to translate ‘Come, let’s have food’ in their mother tongue. A child translated it very well in his mother tongue Marathi. Scott then asked students that if they were given a chance to become an animal, which animal they would choose. Students not only named the animals but even also mimicked the sounds of their favorite animals. The fun continued moving from questions and answers to music. Scott regaled his very young audience when he played some very catchy tunes on his guitar. 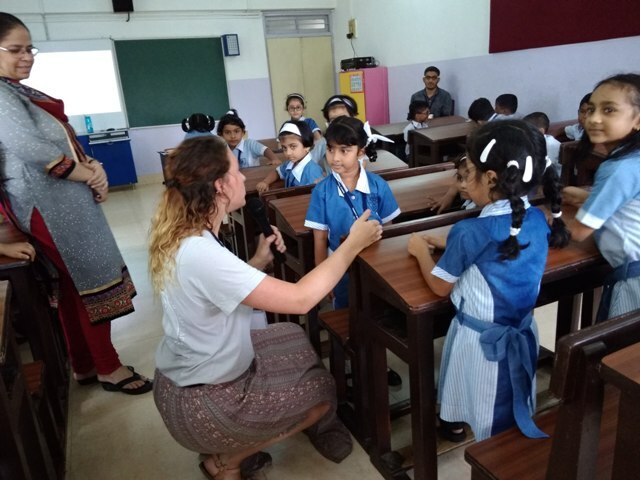 The students of grade III B were filled with enthusiasm when they learnt that their Clap Talk session was to be conducted by Mackenzie Boltz, a 21 year old traveler from Spring field, Illinois, USA. 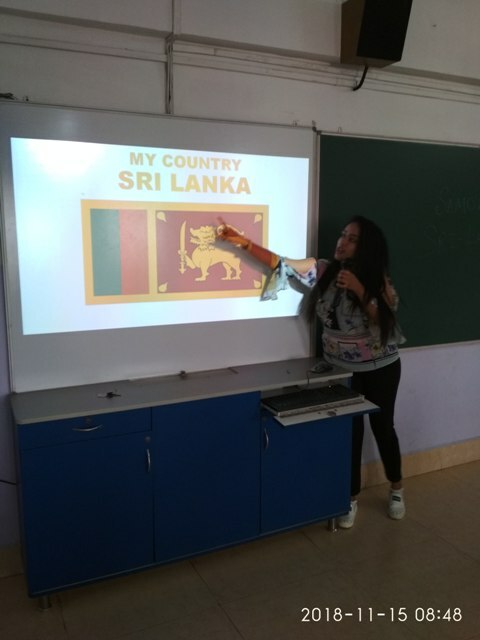 She not only shared about her family and friends but also took the students through a review of the culture and geographical features of her country. She captured the kids’ attention when she shared anecdotes from her childhood. 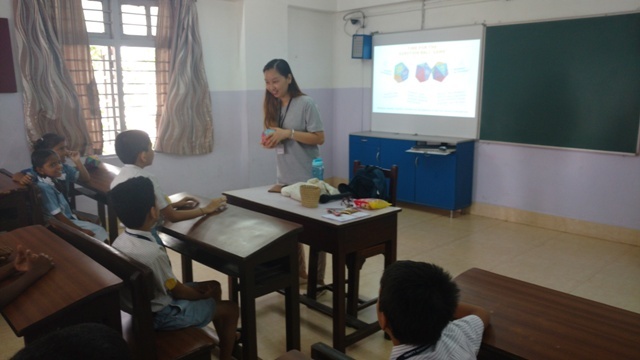 Students held on to every word as she explained the term ‘Down syndrome’ and told about her experience of taking care of an autistic child. The nursery kids had fun making sounds of the rain and trying to jump as high as they can. Students asked her to say Hello like Indians do. She played the ‘duck and goose’ game with the nursery kids and also taught them the action song ‘Hockey-Pockey’. Mackenzie too had a lot of fun dancing with the kids. She showed her love for the environment as she created awareness among the students of Grade 1 by sharing her concern regarding the ill effects of pollution. She not only spoke about the damages but also suggested ways in which students could help to control the damage already caused to the environment with the use of recycling system and to avoid using things like straws, plastic bags etc. that harm the environment. 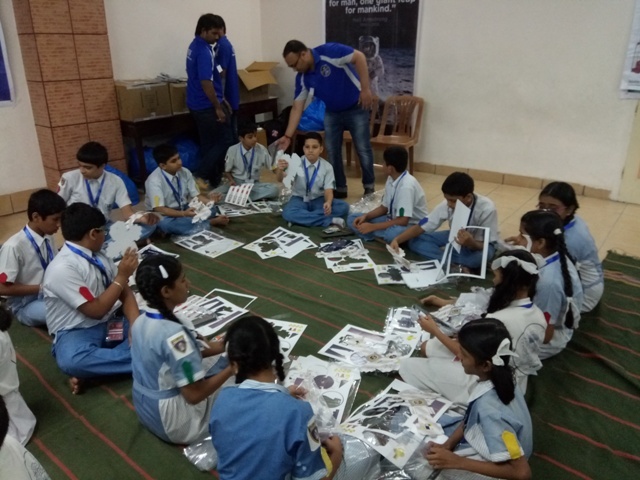 This session surely left a huge impact on the kids especially with regards to the environment. The session became even more fun when Mackenzie and the students swayed to some foot-tapping music. ‘Cao Thi Khann Ly’ instantly gained the attention of the students from Trinity International School, the moment she introduced herself with her unique name. Ly started the session for Grade 1 students by asking them to guess which country she was from. The students named different countries like China, America, Paris, etc. She then told them that she is from Vietnam and went on to share various aspects of her country through the Powerpoint Presentation. A Grade 2 student asked her which place she loved the most in Mumbai, to which she replied that she loved the Queen’s Necklace – Marine Drive. The students had fun trying out holding chopsticks after Ly taught them how to do so. Students of Grades 3 and 4 were amazed to learn about the green taxis and 45 million motorbikes in Vietnam. Ly also spoke about ‘The Lunar New year festival and Mid-Autumn festival. She ended the session by singing a Vietnamese song for the students. Grade 10 students had a knowledgeable session learning different things about Vietnam. The minute Ly mentioned the famous ‘egg coffee’ of Vietnam, there was a collective gasp of disbelief at this unique combination of ingredients. 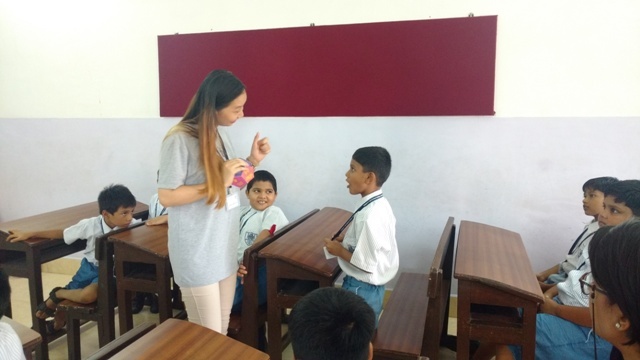 She also mentioned that ‘rice noodles’ was the other signature dish of Vietnam She shared with the students about her desire to become an I.T teacher. Alyona, the pretty young lady from Ukraine began her Clap Talk sessions for grades 2 students by telling them about the lifestyle, seasons and festivals of Ukraine. She also explained to them how Christmas is celebrated in a different way in Ukraine. Students asked her many questions like how do people spend their weekends in Ukraine, what is her favorite weekend activity and what kind of sports are played in Ukraine. They were very enthusiastic to touch the currency of Ukraine. Grade 5 students were interested in learning Ukraine’s location on the map, the history of Ukraine and the existence of different Gods inspite of the national religion being Christianity. The interesting fact that students learnt about the Ukrainian flag was that the blue colour signifies the skies while the wheatish colour represents the wheat grown in Ukraine. The Students learnt the names of 8 gods and their significance. 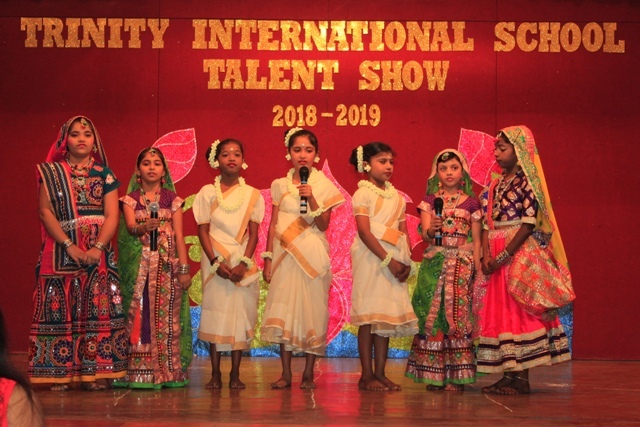 Another interesting fact that caught the students’ attention was the ‘Vyshivanka’ (traditional clothes of Ukraine) and the knowledge that the size of the coral beads on the necklaces worn by the females represented the richness of the families. A Student asked Alyona what she liked most about India and she replied that she liked the kind nature of Indians. It was really a session filled with joy and it proved to be a knowledgeable session where the students learnt a lot of amazing facts about Ukraine. Imane, a ‘jeune dame’ or a young lady from France conducted an amazing and interactive Clap Talk session for grades 1 to 5 and 9. She evoked a lot of curiosity and interest in the minds of the kids of Grades 1 and 2 about France through her powerpoint presentation. The students were more than happy to learn a few French salutations like ‘au revoir and bonjour’. She also asked them to name their favorite colour and the students were eagerly waiting for their turns to answer. Students of Grade 4 were enthusiastic to see the ‘Euros’ that Imane was kind enough to show them. She evoked a desire in the kids to visit the famous ‘La Louvre’ when she spoke about the world’s largest museum and historical monument in France. When She asked them about which country they would like to visit The students named many countries and places that they would love to visit. She told the students of Grade 5 about the Independence Day of France which is celebrated on 14th July and the grand parade that takes place on the streets on this day through pictures. She proudly spoke about the unity of the people of her country, where they come together and protest against any injustice. Her utmost respect for her country could be felt by the students of Grade 9 when she spoke about the President and L’arc of Triomphe, a famous monument in France. When Imane played her national anthem, she was filled with gratefulness and respect for the students of grade 9 who stood up in respect for the national anthem without her expecting them to do so. Imane asked an interesting question to the students about a change that they want to see in the near future, she was really impressed when one of the girls answered that she wanted to see equal rights given to men and women. She ended the session by singing a melodious French song and the students were all praise for her singing skills. Even as she bid ‘Au revoir’ to the students, she motivated the students to always be kind to everyone. The amazing session and the sweet selfie moments with Imane is sure to remain captured in the hearts of these young minds. Around the world in 120 days! 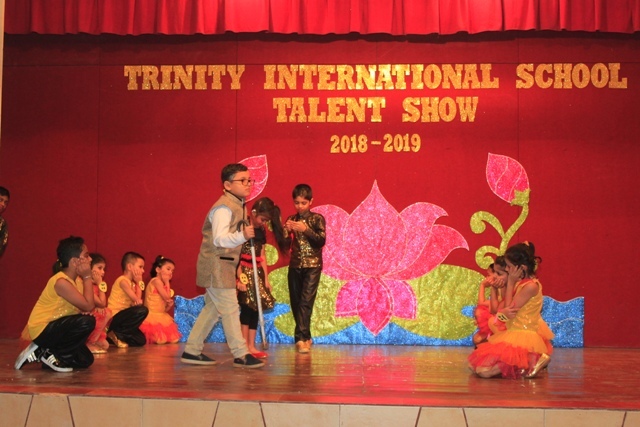 The Annual Exhibition of Trinity International School, held on 31st January 2018 was the culmination of the students’ innovative ideas, inquisitiveness and perseverance. The day stood proof to the synergized efforts of the students and teachers. The projects gave opportunities to students to delve deep into and investigate concepts and present their interpretation of the same. The exhibition consisted of both academic as well as non-academic projects. The projects on display ranged from language games in English, working models in science and various models in social sciences. 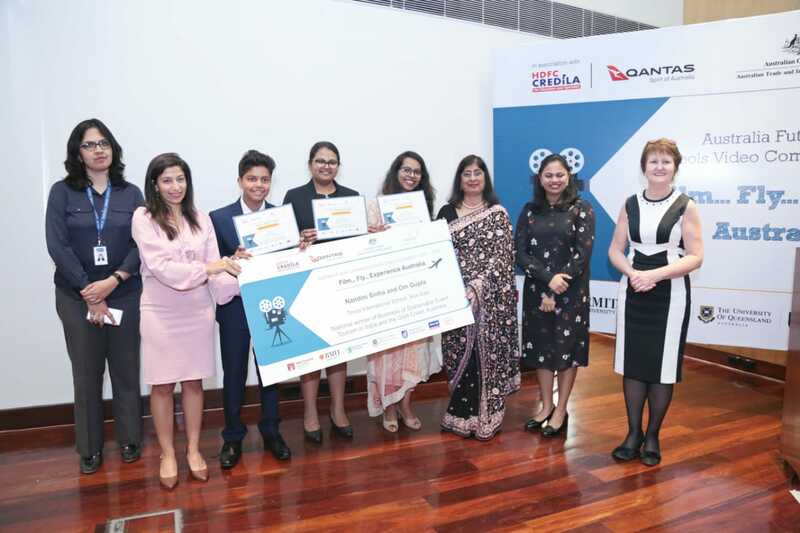 Projects that won prizes at inter school competitions were also on display, namely, the digital technology project on STEAM education which won second prize at MISA-Synergy and Eco-Friendly Festive Decor Project which won the first prize at St. Teresa College of Education. The art and craft section was a testimony of the young minds’ blossoming imagination as well as their interpretation of their immediate world. 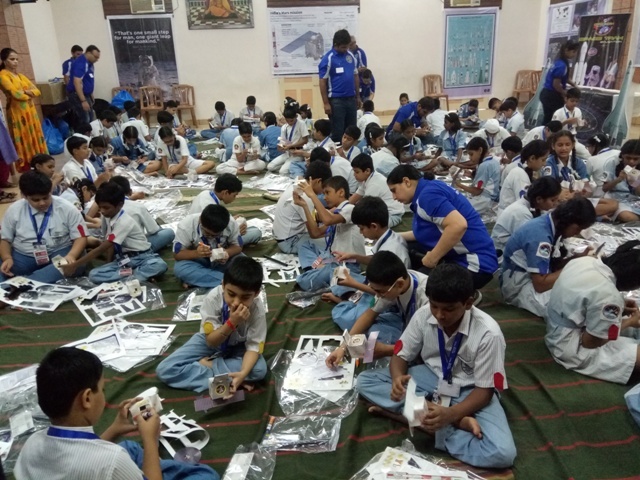 The Eco-Club which conducts activities throughout the year displayed the various projects undertaken: Eco-friendly Ganpati, E-Waste Upcycling, Eco-Friendly pens to name a few. Children from ‘Sparsh’ – an NGO working for street kids – were the special guests for the day. The students were happy to share their knowledge with the guests. Parents were not only happy but also proud to see the quantum of work put in by their wards during the course of the academic year. Aristotle said, ‘Education is the creation of a sound mind in a sound body’. 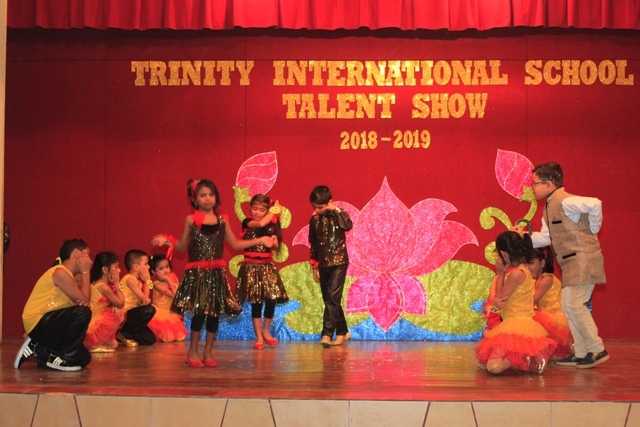 While Trinity International School has always been at the forefront when it comes to providing the best opportunities and facilities to its pupils in the field of sports, the Trinity Premier League was a class apart. 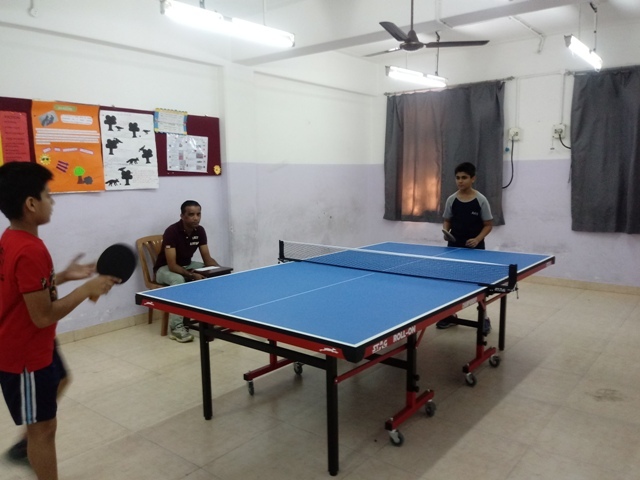 This Interschool Table Tennis Competition, a maiden venture by our school, was an initiative by the Management. 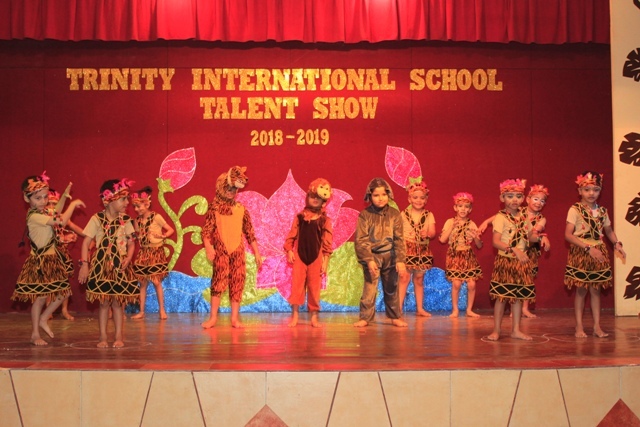 It was planned to perfection by the Principal, Mrs. Vinita D’souza, conceptualized by the coach Mr. Vikesh Mohite and executed with clockwork precision by the entire staff of Trinity International School. The day began with an Inaugural ceremony. The Principal welcomed the audience which comprised participants, parents and teachers and then went on to inaugurate the competition. What followed was an astounding display of sporting skills, healthy competition and of course an unflinching love and passion for the game. A total of 16 schools participated in the competition with over 113 participants. The competition was divided into four categories – namely the Under – 10, Under – 12, Under – 14 and Under – 16 for girls and boys. While each individual match had a nail biting finish, the ultimate winner proved to be the team. 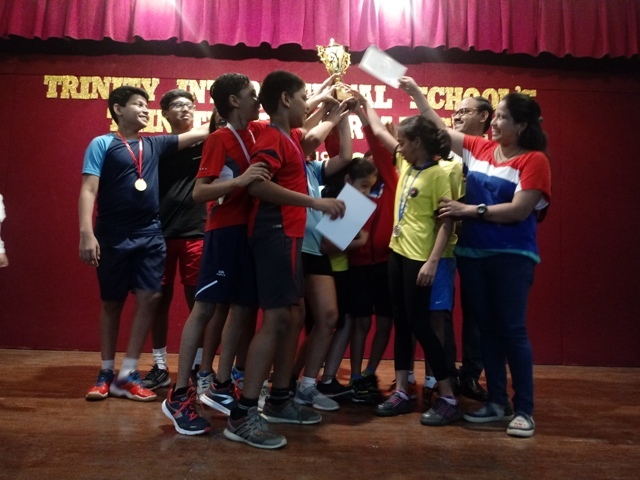 Rustomjee Cambridge School bagged the Overall Champions trophy while Mount Litera School and LRSM Vissanji Academy secured the 2nd and 3rd positions respectively. The day ended with a glittering prize distribution ceremony where the winners were cheered heartily by the parents and teachers. All participants went back inspired to better their performances and achieve newer milestones. 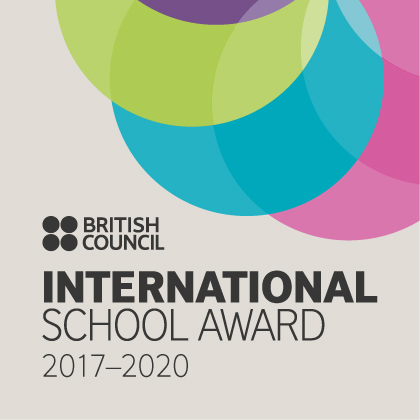 Trinity International School was the proud recipient of the International School Award. 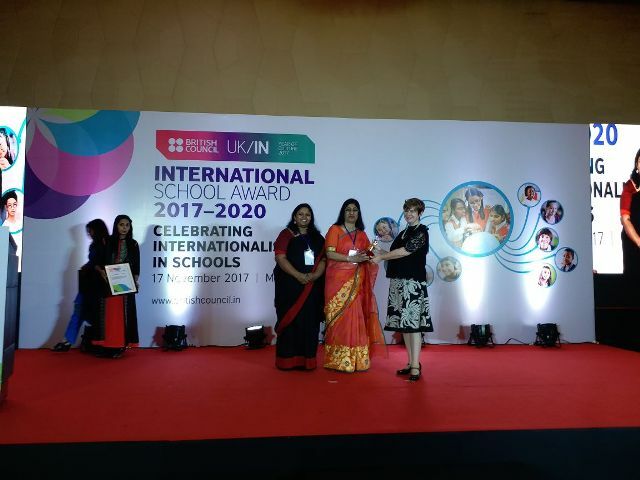 The Principal Mrs. Vinita D’souza and the ISA co-ordinator Mrs. Bharathy Shree were awarded the trophy and plaque in a glittering ceremony held at Hotel Santacruz on 17th November, 2017. The entire team of ISA was felicitated during the Annual Day function on November 18th, 2017. 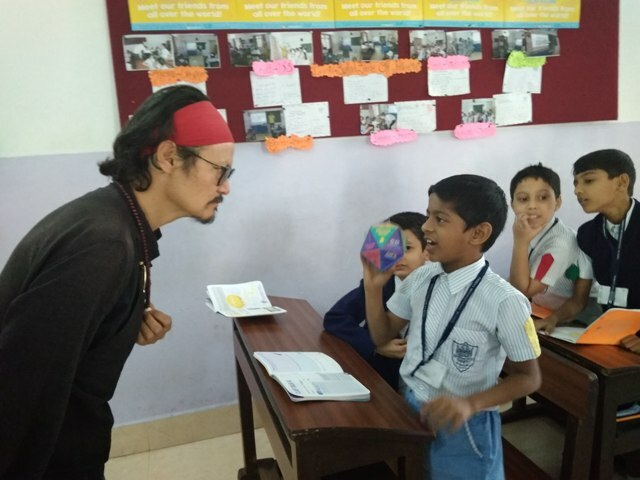 Tenzin Tundue’s coming to Trinity International School was what could be called a life changing experience for many. He came, he spoke and he conquered the hearts, minds and souls of the students. His refugee status did not bother him, if anything it gave that razor edge to the message he wished to convey-the message of peace love and compassion. Students sat riveted to every word he spoke – be it the tales of the yak or his experiences as a prisoner in Tibet. Tenzin also sang a song which he used to sing in the prison for the other inmates leaving the entire audience teary-eyed. He paid the greatest tribute to India when he acknowledged that Gandhiji and his teachings has had the most profound impact on his life and that although he has been all around the world for him India is the only home he knows. The most powerful message he sent across that Tibetans looked up to India as the ‘guru’ of spiritualism and had the power to lead the world through spiritual leadership. Students were reeling under the impact of every word he spoke and when he said that, “I chose to fight for freedom with my pen,” the spontaneous applause refused to die down. 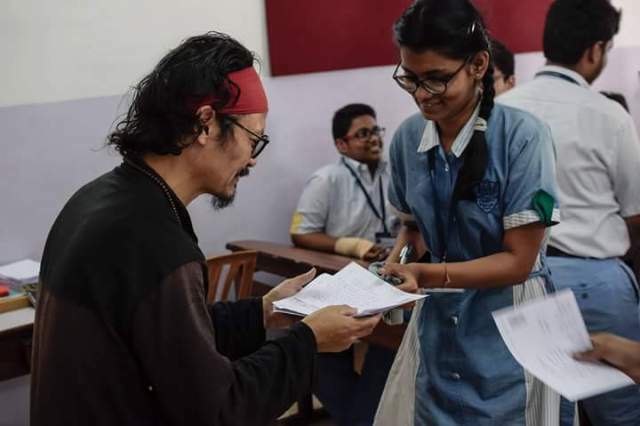 That day Tenzin emerged as a role model for the students not for his profile as an activist or a poet but he embodied timeless values of simplicity, humility, resilience, compassion and the upper most of all – undying, unfettered love for one’s motherland – even when living far away from it. 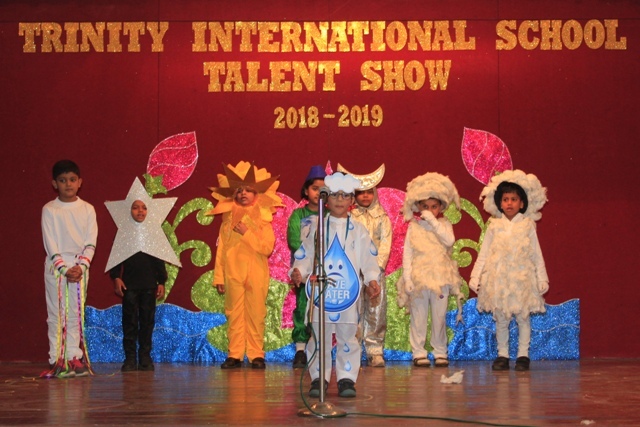 Trinity International School was proud to be part of the initiative ‘Rally For Rivers’. The students were made aware of the urgency to conserve one of the greatest sources of life. Students were also shown a video to create awareness about conserving rivers and various activities were conducted. The students of primary classes created collages, posters and drawings whereas secondary students wrote poems, jingles and rap to convey the importance of this fast depleting reseource. An awareness campaign was conducted in the local community to spread the message of saving the rivers. 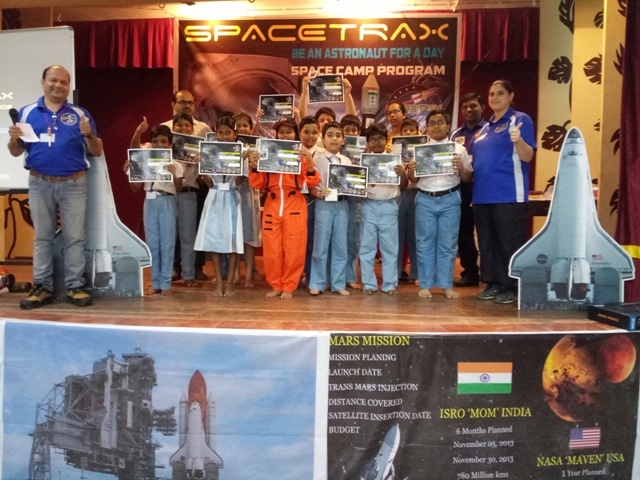 Trinity International School provided a unique experience to its students when it organized a space training workshop conducted by Spacetrax Education. This workshop was spread over two days for grades 5, 6 and 7 on 21st September, 2017 and for grades 8, 9 and 10 on 22nd September, 2017 respectively. 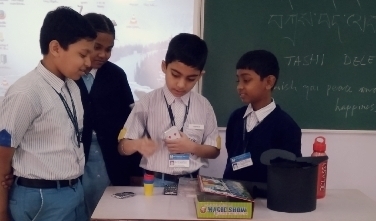 The atmosphere in school was one of expectation and excitement as students were eager to know what exactly they would be doing in this workshop. This excitement was well founded as the schedule for the events lined up for them was nothing short of an exhilarating roller coaster ride. From informative and knowledge dispensing videos and lectures to hands-on activities, games and challenges − this workshop had it all. It was fun and challenging from the word ‘go’. The session began with a general introduction of the programme. 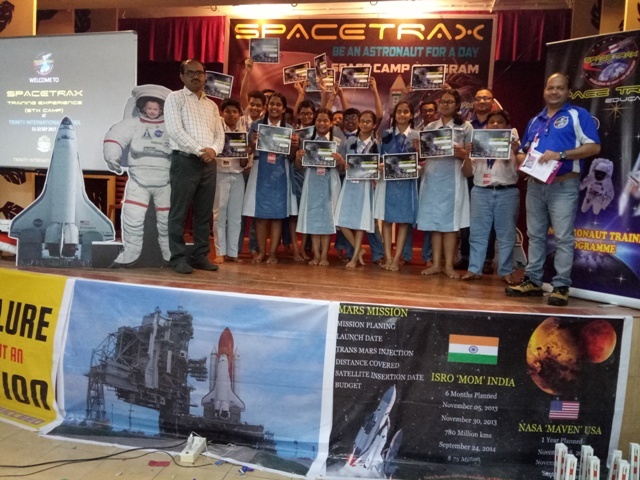 Then it was over to Dr. Rajesh Ghangurde who enthralled the students with his in-depth knowledge about space programmes and missions. 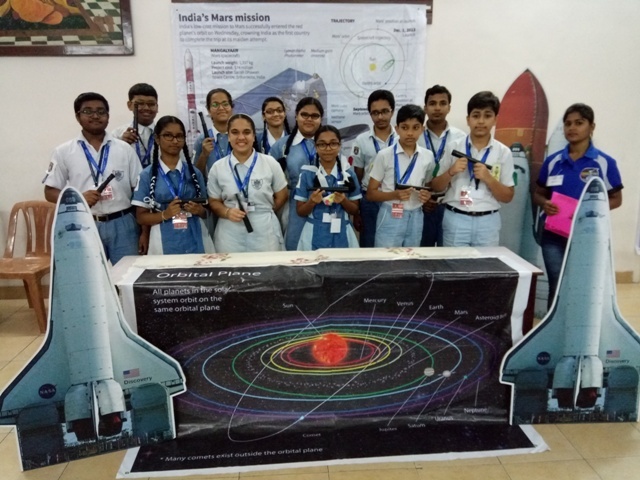 Before these activities began it was made clear to the students that the ultimate winner will be the team to reinforce idea that the success of every space mission is the result of a team effort. The first activity was telescope-making followed by treasure hunt. Each team was judged in terms of not only speed by also co-ordination. The students then made satellites using the kits that were provided to them. This was followed by building launch vehicles and rockets. 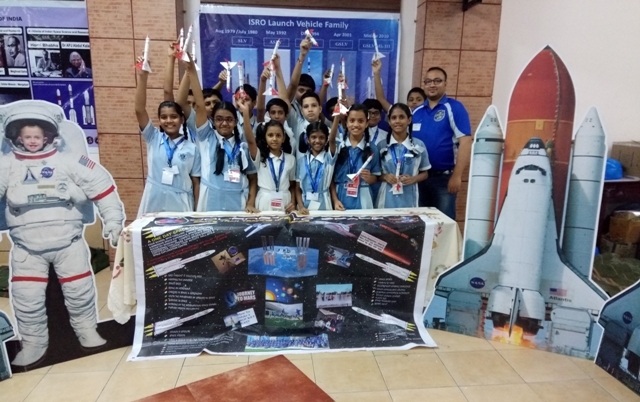 Though each student was provided an individual kit, every member could only claim victory after each member from his team had completed the task. Then students were taken out into the open where they launched their rockets. A target (Mars) was predetermined and team members who were able to launch their rockets to this point were awarded maximum points. After this session it was time to test physical fitness which is of prime consequence when an astronaut sets forth on a mission. An agility test race was next in line where a numbers of obstacles were placed and each team was timed. The team that clocked the best time won. After this it was time to put engineering skills to test as students went on to build bridges following the parameters provided to them. The fun part followed when the bridge built by each team was tested in terms of the weight it could carry. This was done by hooking water bottles on to them. This brought the workshop to its final destination. The Eggstronaut activity wherein each team had to build a capsule with the objective of landing the astronaut safely back to Earth from Mars. Needless to say the session was a resounding success with students asking for more. The entire programme was interspersed with lectures and video sessions to break monotony. The programme ended with an award ceremony where the best team was declared and each student was awarded participation certificates. The shine on the faces of the students said it all as everyone took back wonderful memories and a great store of knowledge at the end of the day. Through the corridors of Trinity International School wafted the aroma of gourmet dishes as the Masterchef activity was conducted in school. 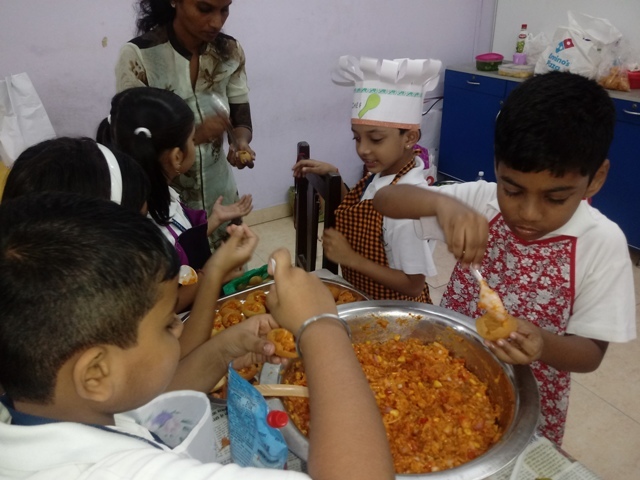 The students along with teachers planned the various dishes. The students brought all the required ingredients from home. There was a plethora of dishes ranging from nachos to burgers to pizzas and panipuri. 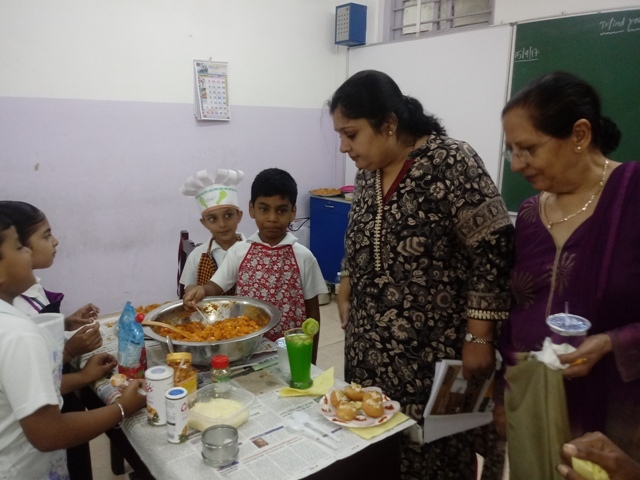 The dishes were judged by our cookery teacher Mrs. Preeti and Mrs. Khurana. 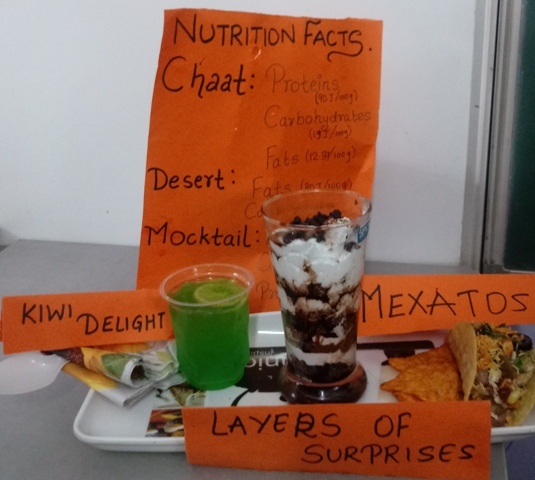 The dishes like ‘The Oreo Saga’, ‘Crazy Nachos’, ‘Layers of Surprise’, Mexitos’ and ‘Cherry Blossom’ won the prices for being innovative, nutritious and scrumptious. Health and cost efficiency being the chief parameters here, the students also learnt the importance of working together as a team. “Give, even if you have little” said Buddha. Keeping this sentiment in mind ‘Joy of Giving Week’ was celebrated in school. The parents opened their hearts and donated generously by way of stationery, toiletries and snacks. In collaboration with the EcoClub, students created various objects out of reusable materials. Primary classes made penholders and pouches using plastic bottles and old jeans. Secondary classes made table organisers and cupboards using carton boxes. The students also visited an old age home at Bandra. They shared their offerings of snacks and toiletries with the elderly. The best gift the students gave them was of their time. The students played Dumb charades with them. It was touching to see the enthusiastic child inside each old soul as they tried to guess the movie names. Another group of students went to St.Catherine’s-orphanage at Andheri. The young children there were excited to receive the gifts made by our students. This celebration of giving has inculcated a value of sharing and caring for the less privileged in the students. ‘Hindi Diwas’ was celebrated with great enthusiasm. Various activities were arranged to commemorate the National Language. A selection round was conducted in all the classes to select participants for the various competitions. The students of primary took part in poetry and story recitation. An extempore competition was conducted for the middle school students where they showcased their linguistic prowess and presence of mind. High school students participated in a debate competition where their communication skills were displayed. There was a sense of jubilation all around The winners were announced and. Youth Skill Day was observed on 15th July in order to enhance and hone the skills of the future citizens. The day was celebrated in school by organising a competition focussing on varied skills. 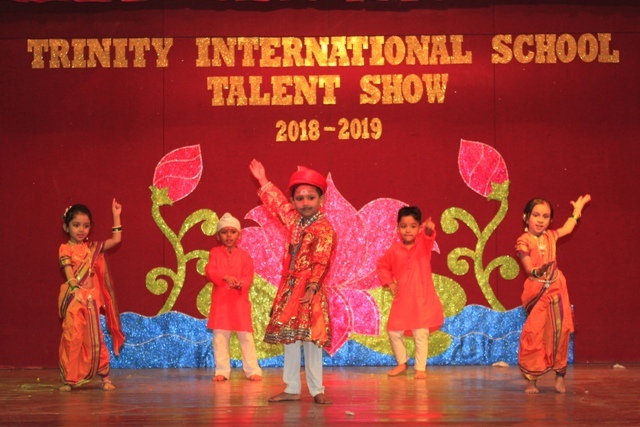 The event was divided at the Primary and Secondary levels.The competition witnessed some excellent dancing, melodious singing, stand up comedy and magic tricks to name a few. There was enthusiastic participation from students. All the participants won points for their houses and the winners were announced. 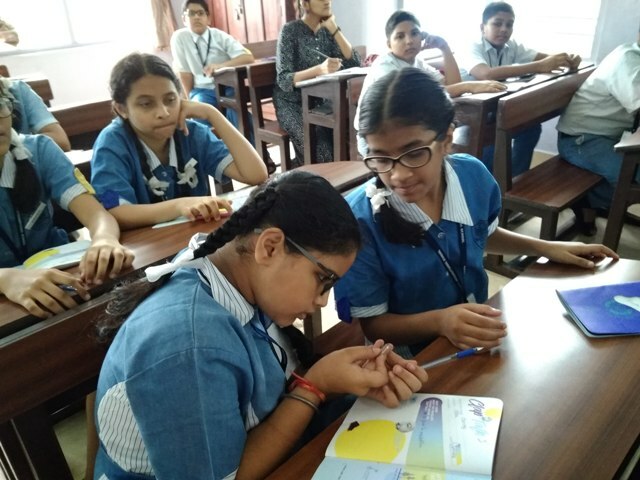 An Inter House Spell Bee Competition was organized on 7th Febrauary 2017 for the students of Std I to IV to assess their vocabulary bank and at the same time create a healthy competition among them. 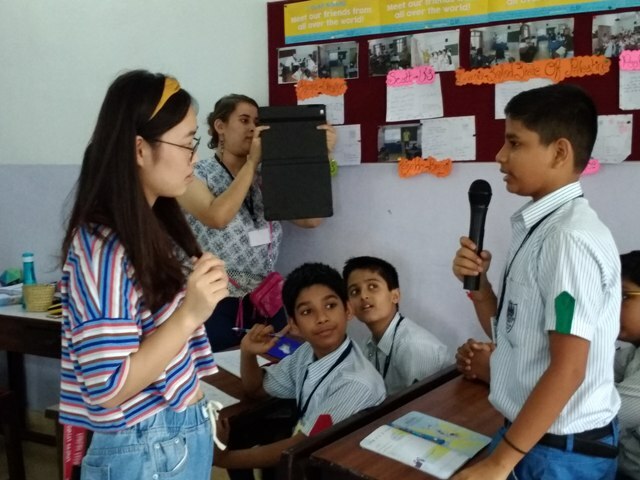 Various rounds such as Spell Me Correct, Word Antakashri, Guess Me, Rapid Fire and Buzzer Round helped to evaluate the linguistic skills of the students. The audience was so charged with enthusiasm, that many among them were eager to participate. The end of the competition saw Blue house walking away with the first prize. What’s the good word- an Inter house English language Quiz Competition was held on 7th February 2017, for the students of Std V to IX. The aim of the competition was to test their vocabulary and language skills. The event comprised five rounds namely, Spell Check, Anagram Riddles, Test your vocabulary, Visual Buzzer Round and Rapid Fire Round. The green house emerged as the winners of the competition. This event helped in assessing their knowledge and developing thinking skills and team work. Students were taken on a delightful gastronomic journey as Community Lunch was organised by the school. This was done to create a sense of community and strengthen the bond they share with their peers. Students relished food of varied countries like Spain and Italy to name a few. This made them appreciate the diversity and variety in terms of food and culture at large. 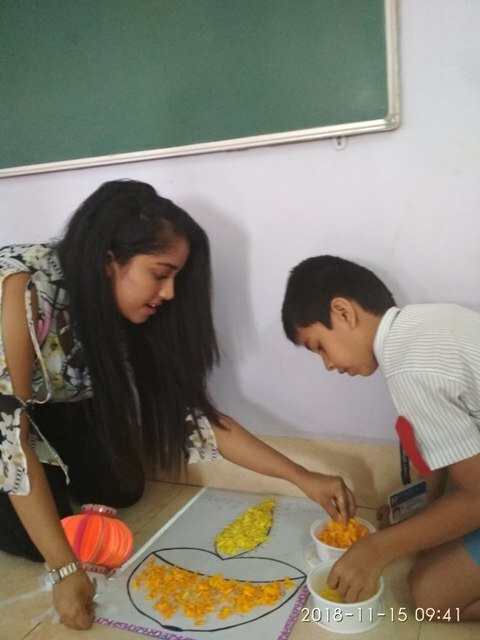 This event also helped in developing social skills and etiquettes and at the same time gave the students an opportunity to connect over food and fun.